Gnostice product release announcements are also available via RSS. Gnostice is pleased to announce the release of version 5.0.0.492 of eDocEngine. In this release, we have added support for RAD Studio 10.3 Rio Update 1 and fixed issues in PDF Engine, RTF Engine, ReportExport and Metafile processing. Gnostice is pleased to announce the release 2019 R1 of the Gnostice StarDocs Cloud edition. This release enhances the text redaction API by adding a setting to consider only capturing groups in a regex. It also includes several fixes in the PDF engine. You can sign up for a free trial to use the cloud API right away. StarDocs provides Web API to enable a variety of document processing and document viewing scenarios. To know more, please see our videos, technical articles and try out the live online demo. Gnostice is pleased to announce the release of Gnostice Document Studio .NET 2019 R1. In this release, we have introduced lazy loading in ASP.NET document viewer control. This release also includes several enhancements, numerous fixes, and general code quality improvements. Gnostice is pleased to announce the release of PDFtoolkit VCL 5.0.0.739. In this release, we have added support for RAD Studio 10.3 Rio Update 1, optimised output file size while merging PDFs and extracting pages. We have also fixed several issues in PDF processing and viewing. Gnostice is pleased to announce the release of Version 5.5.1011.617 of PDFOne (for Java), our all-in-one PDF component suite for Java SE/EE developers. This release includes support for digital signing of documents using USB token, writing of text using Strikethrough font style, several optimization enhancements, and fixes in PDF processing & rendering. Gnostice is pleased to announce the release of Gnostice Document Studio Delphi 19.1.2875.4147. This version includes the Bookmarks Navigation Pane, improved document printing features, and various bug fixes for FMX and VCL Document Viewers. This version also includes fixes for Report Export Interfaces. You can download the virtual appliance and host it on your virtualization platform on your private servers. StarDocs provides Web APIs to enable a variety of document processing and document viewing scenarios. To know more, please see our videos, the technical articles and try out the live online demo. Gnostice is pleased to announce the release of PDFtoolkit VCL 5.0.0.721. In this release, we have added support for RAD Studio 10.3 Rio, improved rendering and printing of barcodes and QR-codes. We have also fixed several issues in PDF processing and viewing. Gnostice is pleased to announce the release of version 5.0.0.479 of eDocEngine. In this release, we have added support for RAD Studio 10.3 Rio and also supported encoding of alpha blended images. Several issues in PDF Engine, Excel Engine, Report Export and RTF Engine are also fixed. Gnostice is pleased to announce the release of Gnostice Document Studio Delphi 2018 R2 Build 18.2.2853. This version includes support for RAD Studio 10.3 Rio. The latest and Greatest Delphi. This version also includes Bookmark reading API for PDF, TIFF loading optimizations, and various bugfixes. Gnostice is pleased to announce the release of Gnostice Document Studio Delphi 2018 R2 Build 18.2.2831. Enhancements and improvements in this version include, restoration of support for C++Builder, a common Document Reader and Renderer between VCL and FMX facilitated by introduction of framework independent native canvas interface, several PDF rendering improvements, major package and code refactorings resulting in major reduction in installer size, and other fixes and enhancements. We wanted to make the marketing name simpler. Thus, we have changed the marketing name of Gnostice XtremeDocumentStudio Delphi to Gnostice Document Studio Delphi. This change has no impact on the programming interface. There is no code break due to this change. We have also made changes to the SKUs based on popular demand. Essential [$250], Professional [$450], and Ultimate [$600]. Essential edition replaces ReportExport edition. Essential edition includes multi-format document Viewing, Printing and Report Export. No source. Professional edition includes all document processing features, Viewing, Printing, Conversion, Report Export, and more. With source code. Gnostice is pleased to announce the release of Gnostice PDFOne .NET 7.5.663.1526. In this release, we have introduced mouse modes for area selection and drag & zoom feature. This release also includes support for interactivity for Link and Popup annotations, several enhancements and bug fixes. Gnostice is pleased to announce the 2018 R1 release of the Gnostice StarDocs On-Premises edition. This release introduces text search API for PDF files, and other enhancements and fixes. Gnostice is pleased to announce the release 2018 R1 of the Gnostice StarDocs Cloud edition. This release introduces text search API for PDF files, and other enhancements and fixes. Gnostice is pleased to announce the release of XtremeDocumentStudio .NET 2018 R2. In this release, we have introduced loading encrypted PDF documents in ASP.NET document viewer control and honoring of document security restrictions. This release also includes several enhancements, numerous fixes, and general code quality improvements. .NET Conf: Have you registered? Gnostice is pleased to announce the release of Gnostice XtremeDocumentStudio Delphi 2018 R1 Build 18.1.2745. This version includes fixes and quality improvements to the FMX Document Viewer. Gnostice is pleased to announce the release of XtremeDocumentStudio 2018 R1 build 18.1.2725. In this release, we have redesigned FMX Document Viewer for Smooth, responsive experience in all platforms including Android and iOS. This release also includes various enhancements and fixes in report export. Gnostice is pleased to announce the release of version 5.0.0.669 of PDFtoolkit VCL. In this release, we have added support for digitally signing PDFs using USB tokens, saving PDFs to monochrome TIFF files, rendering of PDFs with axial shading pattern and transparency group XObjects, and improved several other features. We have also fixed several issues in PDF processing and viewing. Gnostice is pleased to announce the release of XtremeDocumentStudio (for Java), the next-generation multi-format document-processing framework for Java SE/EE developers. In this release, we have included support for reading RTF & HTML formats, enhanced reading of faulty PDF documents and several fixes in Word formats rendering, PDF processing & rendering. Gnostice is pleased to announce the release of Version 5.4.950.586 of PDFOne (for Java), our all-in-one PDF component suite for Java SE/EE developers. This release includes enhancement for reading faulty PDF documents and fixes in PDF processing & rendering. Gnostice is pleased to announce the release of XtremeDocumentStudio .NET 2018 R1. In this release we have introduced database document caching mechanism in ASP.NET document viewer control, and image preprocessing techniques are added to improve the accuracy of recognized text. v2018 R1 also includes several enhancements, numerous fixes and general code quality improvements. Gnostice is pleased to announce the release of version 5.0.0.633 of PDFtoolkit VCL. In this release, we have added support for RAD Studio 10.2 Tokyo Update 2, reading signer information from signature certificate, signature validation for single signature and support to get stamp name from stamp annotation. Also, several issues are fixed in PDF processing. Gnostice is pleased to announce the release of version 5.0.0.357 of eDocEngine. In this release, we have added support for RAD Studio 10.2 Tokyo update 2, RichView 17 and fixed issue in Excel Engine. Gnostice is pleased to announce the release of XtremeDocumentStudio .NET 2017 R5. In this release we have introduced support for RTF files as output format, and support for form field input validation and calculation in HTML5 Document Viewer. v2017 R5 also includes numerous fixes and general code quality improvements. Gnostice is pleased to announce the release of Gnostice PDFOne .NET 7.4.558.1320. In this release we have introduced support for rendering of annotations with no appearance stream. This release also includes several major enhancements and general bug fixes. Gnostice is pleased to announce the 2017 R6 release of the Gnostice StarDocs On-Premises edition. The R6 release introduces option to change the admin password of the Administrative Console, PDF forms API, and other enhancements and fixes. Gnostice is pleased to announce the release of version 5.0.0.344 of eDocEngine. In this release, we have added support for encoding transparent images for PDF generation. Several issues in PDF engine, Excel engine, and metafile processing were fixed. Gnostice is pleased to announce the release 2017 R6 of the Gnostice StarDocs Cloud edition. The R6 release introduces PDF forms API, and other enhancements and fixes. Gnostice is pleased to announce the release of version 5.0.0.612 of PDFtoolkit VCL. In this release, we fixed several issues in PDF rendering, processing and printing. Gnostice is pleased to announce the release of XtremeDocumentStudio Delphi 2017 R5 Preview. In this release we introduced interactive PDF form filling support in the FMX Document Viewer across Windows, macOS, iOS, and Android. Other enhancements to FMX Viewer include support for saving documents, rendering shapes with tiling graphics pattern fill, rendering paragraph alignment properties in DOCX. This version also includes several fixes for FMX and VCL document viewers. Gnostice is pleased to announce the release 2017 R5 of the Gnostice StarDocs Cloud edition. The R5 release fixes multiple Word format rendering issues as well as DOCX and TXT format rendering issues. You can sign up for a free trial to use the cloud API right away. StarDocs provides Web API to enable a variety of document processing and document viewing scenarios. To know more, please see our videos, technical articles and try out the live online demo. Gnostice is pleased to announce the patch release 2017 R5.1 of the Gnostice StarDocs On-Premises edition. The R5.1 patch fixes multiple Word format rendering issues as well as DOCX and TXT format rendering issues. You can download the virtual appliance and host it on your virtualization platform on your private servers. StarDocs provides Web APIs to enable a variety of document processing and document viewing scenarios. To know more, please see our videos, the technical articles and try out the live online demo. Gnostice is pleased to announce the release of version 5.0.0.289 of eDocEngine. In this release, we have added support for RAD Studio 10.2 Tokyo update 1 and fixed issues in metafile processing, RTF Engine and PDF Engine. Gnostice is pleased to announce the release of version 5.0.0.565 of PDFtoolkit VCL. In this release, we have added support for RAD Studio 10.2 Tokyo Update 1 and added New APIs for PDF Forms processing. Gnostice is pleased to announce the release of XtremeDocumentStudio Delphi 2017 R4 Update 2. This is a refresh build for RAD Studio 10.2 Tokyo Update 1. Gnostice is pleased to announce the release 2017 R5 of the Gnostice StarDocs On-Premises edition. The R5 release fixes font rendering issue for the Symbol font. You can download the virtual appliance and host it on your virtualization platform on your private servers. StarDocs provides Web APIs to enable a variety of document processing and document viewing scenarios. To know more, please see our videos, the technical articles and try out the live online demo. Gnostice is pleased to announce the release of XtremeDocumentStudio Delphi 2017 R4 Update 1. In this release we Augmented EventArgs of Mouse events of Document Viewer to receive additional mouse state, page and selection information. New enhanced Click and DblClick events with Page and other View related information in EventArg were also introduced. Updates to DOCX/Word rendering moved forward along with bug fixes in PDF rendering. Gnostice is pleased to announce the release of version 5.0.0.552 of PDFtoolkit VCL. In this release we have added support for rendering of elements that use GraphicsState with SMask and Transparency Group XObjects. Form field rendering was also improved and several issues fixed in rendering, printing and processing PDF. Gnostice is pleased to announce the release 2017 R4 of the Gnostice StarDocs Cloud edition. The R4 release introduces support for HTML file format. This release also adds support to draw watermarks on the pages being viewed and printed, and also includes several important fixes in the Word formats engine which considerably improves the rendering of these files. You can sign up for a free trial to use the cloud API right away. StarDocs provides Web API to enable a variety of document processing and document viewing scenarios. To know more, please see our videos, the technical articles and try out the live online demo. Gnostice is pleased to announce the patch release 2017 R4.1 of the Gnostice StarDocs On-Premises edition. The R4.1 release introduces support for HTML file format. This release also adds support to draw watermarks on the pages being viewed and printed, and also includes several important fixes in the Word formats engine which considerably improves the rendering of these files. You can download the virtual appliance and host it on your virtualization platform on your private servers. StarDocs provides Web APIs to enable a variety of document processing and document viewing scenarios. To know more, please see our videos, the technical articles and try out the live online demo. Gnostice is pleased to announce the release of XtremeDocumentStudio .NET 2017 R4. In this release we have introduced internationalization support for HTML5 Document Viewer control using jQuery.i18n.properties jQuery library. R4 also includes several fixes and general code quality improvements. Gnostice is pleased to announce the release 2017 R3 of the Gnostice StarDocs Cloud edition. The R3 release introduces support for Microsoft RTF and plain text file formats. This release also includes several important fixes in the DOC and DOCX engine which considerably improves the rendering of bulleted lists, text alignment, and text rendering. You can sign up for a free trial to use the cloud API right away. StarDocs provides Web API to enable a variety of document processing and document viewing scenarios. To know more, please see our videos, the technical articles and try out the live online demo. Gnostice is pleased to announce the release 2017 R4 of the Gnostice StarDocs On-Premises edition. The R4 release introduces support for Microsoft RTF and plain text file formats. This release also includes important fixes in the DOC and DOCX rendering engines. You can download the virtual appliance and host it on your virtualization platform on your private servers. StarDocs provides Web APIs to enable a variety of document processing and document viewing scenarios. To know more, please see our videos, the technical articles and try out the live online demo. Gnostice is pleased to announce the release of version 5.0.0.271 of eDocEngine. In this release, we added support for Unicode text output in Text and CSV formats. Also introduced new formatting logic for CSV format and fixed issues in Metafile processing, RTF and PDF engines. Gnostice is pleased to announce the release of XtremeDocumentStudio Delphi 2017 R4. In this release we went into the intricacies of the zoom and scroll features of the Document Viewer. We enhanced APIs and GUI interactions with mouse, and also introduced new API and GUI behaviours. On-going updates to DOCX/Word rendering moved forward along with other enhancements and fixes. Gnostice is pleased to announce the release of XtremeDocumentStudio (for Java), the next-generation multi-format document-processing framework for Java SE/EE developers. In this release, we have included support for reading DOC binary format, completely revamped DOCX engine, enhanced reading of faulty PDF documents, rendering of OTF font text in PDF documents and fixes in PDF processing & rendering. Gnostice is pleased to announce the release of XtremeDocumentStudio .NET 2017 R3. In this release we have introduced interactive link annotations with support for various PDF actions in HTML5 Document Viewer control. R3 also includes several fixes and general code quality improvements. Gnostice is pleased to announce the release of version 5.0.0.249 of eDocEngine. In this release, we have fixed issues in Excel Engine and report export. Gnostice is pleased to announce the release of version 5.0.0.496 of PDFtoolkit VCL. In this release we enhanced forms support including support for multi-select List Box fields and fixed several issues in rendering, printing and processing. Gnostice is pleased to announce the release of XtremeDocumentStudio .NET 2017 R2. In this release, a new feature to annotate PDF files has been introduced in HTML5 Document Viewer control to view, interactively update and to add new note annotations. R2 also includes several enhancements in XLSX, XLS and ODS rendering, several fixes in other areas, and general code quality improvements. Gnostice is pleased to announce the release of XtremeDocumentStudio Delphi 2017 R3. This release includes major enhancements in PDF rendering with native rendering for all FMX platforms - Win32/64, OS X, iOS and Android. We have added support for RAD Studio 10.2 Tokyo along with several enhancements in PDF rendering, and fixes in viewing, conversion and Report Export. Gnostice is pleased to announce the release of version 5.0.0.485 of PDFtoolkit VCL. In this release we have enhanced PDF rendering in the area of High resolution image handling, printing and fixed several issues in rendering, printing and processing. Gnostice is pleased to announce the release of Version 5.4.863.533 of PDFOne (for Java), our all-in-one PDF component suite for Java SE/EE developers. This release includes support for rendering of OTF font text and several fixes in PDF processing and rendering. Gnostice is pleased to announce the release of eDocEngine 5.0.0.226. This release includes new text rendering mode to add invisible text to PDF and improved text layouting/formatting in RTF engine. This release also includes important fixes for PDF Engine, RTF Engine and Metafile processing. Gnostice is pleased to announce the release of version 5.0.0.451 of PDFtoolkit VCL. In this release, we have added support for RAD Studio 10.2 Tokyo along with several enhancements in PDF rendering, and fixes in viewing, printing and pdf processing. Gnostice is pleased to announce the release of version 5.0.0.214 of eDocEngine. In this release, we have added support for RAD Studio 10.2 Tokyo and fixed issues in metafile processing and Ace Report export interface. Gnostice is pleased to announce the release of version 5.0.0.205 of eDocEngine. In this release, we have fixed issues in Excel, PDF and TIFF engines. Gnostice is pleased to announce the release of version 5.0.0.414 of PDFtoolkit VCL. In this release, we have enhanced PDF rendering in the area of image handling and fixed several issues in rendering and processing. Gnostice is pleased to announce the release 2017 R2 of the Gnostice StarDocs Cloud edition. The R2 release enhances the Document Viewer by introducing a new navigation pane with options for navigating the document using page thumbnails (for all supported formats) and bookmarks (for PDF files only). This release also includes several important fixes in the DOC and DOCX engine which considerably improves the rendering of bulleted lists, text alignment, and text rendering. You can sign up for a free trial to use the cloud API right away. StarDocs provides Web API to enable a variety of document processing and document viewing scenarios. To know more, please see the technical articles and try out the live online demo. Gnostice is pleased to announce the release 2017 R2 of the Gnostice StarDocs On-Premises edition. The R2 release enhances the Document Viewer by introducing a new navigation pane with options for navigating the document using page thumbnails (for all supported formats) and bookmarks (for PDF files only). This release also includes several important fixes in the DOC and DOCX engine which considerably improves the rendering of bulleted lists, text alignment, and text rendering. You can download the virtual appliance and host it on your virtualization platform on your private servers. StarDocs provides Web APIs to enable a variety of document processing and document viewing scenarios. To know more, please see the technical articles and try out the live online demo. Gnostice is pleased to announce the release 2017 R1 of the Gnostice StarDocs Cloud edition. This release introduces support for Microsoft DOC format for viewing and conversion. The DOCX engine has been completely rewritten for a much improved viewing and conversion experience. It also introduces digitization feature in the Document Converter API to convert from scanned images and scanned PDF files to searchable PDF files. You can sign up for a free trial to use the cloud API right away. StarDocs provides Web API to enable a variety of document processing and document viewing scenarios. To know more, please see the technical articles and try out the live online demo. Gnostice is pleased to announce the release of XtremeDocumentStudio .NET 2017 R1. In this release, a new navigation pane system has been introduced in HTML5 Document Viewer control with support for page navigation through thumbnails and bookmarks. R1 also includes several enhancements in XLSX, XLS and ODS rendering, several fixes in other areas, and general code quality improvements. Gnostice is pleased to announce the release of XtremeDocumentStudio Delphi 2017 R1 with NG Beta 5. In this release we have made several framework level improvements for progressive processing and rendering of Word formats, PDF rendering improvements in FMX, and improvements to the VCL and FMX Viewer controls. Gnostice is pleased to announce the release 2017 R1 of the Gnostice StarDocs On-Premises edition. The 2017 R1 release introduces support for Microsoft DOC format for viewing and conversion. The DOCX engine has been completely rewritten for a much improved viewing and conversion experience. This release also includes several important enhancements and fixes. You can download the virtual appliance and host it on your virtualization platform on your private servers. StarDocs provides Web APIs to enable a variety of document processing and document viewing scenarios. To know more, please see the technical articles and try out the live online demo. Gnostice is pleased to announce the release of XtremeDocumentStudio Delphi 2016 R10 Beta 4. In this release we have made several framework level improvements for background rendering of documents, PDF and Word formats rendering improvements, VCL and FMX Viewer controls improvements, and general code quality improvements. This release is also built for RAD Studio 10.1 Berlin Update 2. Gnostice is pleased to announce the release of version 5.0.0.384 of PDFtoolkit VCL. In this release, we have added support for RAD Studio 10.1 Berlin Update 2 along with several enhancements in PDF rendering, and fixes in viewing, printing and form filling operations. Gnostice is pleased to announce the release of Gnostice PDFOne .NET 7.3.500.1242. In this release we have introduced support for viewing documents with “JPEG2000” images and shapes with tiling graphics pattern. This release also includes support for encryption/decryption of documents using AES 256-bit algorithm and several major enhancements and general bug fixes. Gnostice is pleased to announce the release of version 5.0.0.164 of eDocEngine. In this release, we have added support for RAD Studio 10.1 Berlin Update 2 and fixed issues in metafile processing and HTML Engine. Gnostice is pleased to announce the release of Version 5.4.821.523 of PDFOne (for Java), our all-in-one PDF component suite for Java SE/EE developers. This release includes support for reading faulty PDF documents and fixes in PDF processing and rendering. Gnostice is pleased to announce the release of XtremeDocumentStudio .NET 2016 R6. In this release we have introduced support for viewing, printing and converting Excel/Spreadsheet documents (XLSX, XLS, ODS)[BETA]. R6 also introduces document viewer component for Xamarin.Forms [BETA] for viewing DOCX, DOC, RTF, BMP, PNG, JPG documents. Gnostice is pleased to announce the release R4 of the Gnostice StarDocs On-Premises edition. The R4 release introduces digitization feature in the Document Converter API to convert from scanned images and scanned PDF files to searchable PDF files. This release also includes several important enhancements and fixes. You can download the virtual appliance and host it on your virtualization platform on your private servers. StarDocs provides Web APIs to enable a variety of document processing and document viewing scenarios. To know more, please see the technical articles and try out the live online demo. Gnostice is pleased to announce the release of version 5.0.0.141 of eDocEngine. This release includes the new completely rewritten and highly improved Excel engines that produce perfect spreadsheet outputs from reports and EMF inputs. The spreadsheet engines also expose several new properties to configure the formatting and generation process. This release also include important fixes for PDF engine, PDF/A generation and Graphic engines. Gnostice is pleased to announce the release of Gnostice XtremeDocumentStudio Delphi 2016 R8 Beta 2. In this release, we have added support for iOSSimulator, iOSDevice32, iOSDevice64, Android targets (XE8 onwards), processing and rendering PDF, DOC, DOCX, RTF in Mobile targets and fixes for document viewer. Gnostice is pleased to announce the release R1 of the Gnostice StarDocs Cloud edition. The R1 release includes several enhancements to the multi-format document viewer such as speed up of rendering and much improved form filling experience. It also includes critical fixes to the PDF engine. You can sign up for a free trial to use the cloud API right away. StarDocs provides Web API to enable a variety of document processing and document viewing scenarios. To know more, please see the technical articles and try out the live online demo. Gnostice is pleased to announce the release R3 of the trial of the Gnostice StarDocs On-Premises edition. The R3 release includes the capability to easily update the server software without having to download the entire Virtual Appliance. R3 also includes critical fixes to the PDF engine. You can download the virtual appliance and host it on your virtualization platform on your private servers. StarDocs provides Web API to enable a variety of document processing and document viewing scenarios. To know more, please see the technical articles and try out the live online demo. 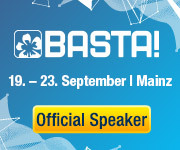 BASTA, the premier conference for .NET developer in Germany, Austria and Switzerland. September 20-22, 2016, Mainz, Germany. Delphi Tage, the popular Delphi related conference in Germany. September 17, 2016. Cologne, Germany. PASCON/The Delphi Festival. September 20, 2016. Nieuwegein, The Netherlands. Girish Patil and Ramnish Radhakrishnan will be presenting their session, Document Technology for Mobile and Desktop Development, again for a new audience. Gnostice is pleased to announce the release R2 of the trial of the Gnostice StarDocs On-Premises edition. The R2 release includes the capability to setup secure end-points with your own SSL certificate. R2 also includes other major enhancements in PDF forms viewing and filling. You can download the virtual appliance and host it on your virtualization platform on your private servers. StarDocs provides Web API to enable a variety of document processing and document viewing scenarios. To know more, please see the technical articles and try out the live online demo. Gnostice is pleased to announce the release of XtremeDocumentStudio (for Java), the next-generation multi-format document-processing framework for Java SE/EE developers. In this release we have included support for encryption and decryption of PDF documents using AES 256-bit algorithm and fixes in PDF processing, rendering, and printing. Gnostice is pleased to announce the release of XtremeDocumentStudio .NET 2016 R5. In this release we have improved the HTML5 Document Viewer with enhanced form filling capabilities, introduced keyboard navigation support, highlight color selection settings, introduced APIs to save form field updates and much more. We have also introduced support for rendering AES 256-bit encrypted PDF documents. Gnostice is pleased to announce the release of PDFtoolkit VCL 5.0.0.313. In this release, we have fixed several issues in the PDF viewer component and in the area of PDF processing. C++Builder related issues with Berlin 10.1 are also addressed. Gnostice is pleased to announce the release of Version 5.4.786.519 of PDFOne (for Java), our all-in-one PDF component suite for Java SE/EE developers. This release includes support for encryption and decryption of PDF documents using AES 256-bit algorithm and fixes in PDF processing, rendering, and printing. Gnostice is really pleased to announce the new simplified licensing terms for all our developer targeted products. Now, even with our .NET and Java developer tools, you get Royalty-Free distribution rights for your applications without additional fees to Gnostice. Our .NET and Java developer tools earlier required an additional server deployment license for deploying applications to Web/Internet servers. There are relatively small price increases for the Ultimate editions of XtremeDocumentStudio .NET and XtremeDocumentStudio Java products. Along with the license change, we have also introduced a new "Desktop" edition for XtremeDocumentStudio .NET. The Desktop edition contains only the WinForms and WPF controls. It carries a lower price tag. For more information, please read the simplified licensing guide. Gnostice is pleased to announce the availability of the trial of the Gnostice StarDocs On-Premises edition. You can now download the virtual appliance and host it on your virtualization platform on your private servers. StarDocs provides Web API to enable a variety of document processing and document viewing scenarios. To know more, please see the technical articles and try out the live online demo. Gnostice is pleased to announce the release of XtremeDocumentStudio (for Java), the next-generation multi-format document-processing framework for Java SE/EE developers. In this release we have made several enhancements and fixes in PDF processing and rendering, and digitization. Gnostice is pleased to announce the release of XtremeDocumentStudio .NET 2016 R4. In this release we have improved the HTML5 Document Viewer with enhanced form filling capabilities, introduced API to load document from an URI and much more. We have also introduced JPEG2000 image rendering support in PDF. Gnostice is pleased to announce the release of Version 5.3.18 of PDFOne (for Java), our all-in-one PDF component suite for Java SE/EE developers. In this release, we have made several enhancements and fixes in PDF processing and rendering. Gnostice is pleased to announce the release of XtremeDocumentStudio .NET 2016 R3. In this release we have redesigned the HTML5 Document Viewer from the ground up and made many enhancements to it. We have also introduced text search feature on images using Optical Character Recognition (OCR) and interactive form-filling with submit and reset actions. This release also provides support for TypeScript. Gnostice is pleased to announce the release of Gnostice XtremeDocumentStudio Delphi 2016 R6. 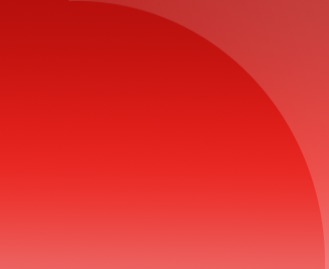 In this release, we have added support for RAD Studio 10.1 Berlin and fixed various issues. Gnostice is pleased to announce the release of version 5.0.0.81 of eDocEngine. In this release, we have added support for RAD Studio 10.1 Berlin and fixed various issues in metafile processing, and generation of PDF, Excel and text files. Gnostice is pleased to announce the release of XtremeDocumentStudio Delphi 2016 R5. In this release, we have introduced support for rendering tiling graphics pattern. We have also optimized the rendering of Type3 fonts. Gnostice is pleased to announce the release of PDFToolkit VCL 5.0.0.266. In this release, we have introduced support for rendering Type3 fonts and tiling graphics pattern and applying multiple digital signatures. Gnostice is pleased to announce the release of version 5.0.0.65 of eDocEngine. In this release we have added support for setting additional form field preferences in the PDF Engine. Other fixes are also included for PDF generation and Report Export. We are excited to announce our participation as a sponsor of the Microsoft Build 2016 conference. Build, Microsoft's premier conference for software developers, is scheduled to be held between March 30 and April 1, 2016 in San Francisco, California. We were invited by Microsoft to come and exhibit at Build and we are happy to say we will be there. Gnostice is pleased to announce the release of Gnostice XtremeDocumentStudio Delphi 2016 R4. In this release, we have introduced support for rendering PDFs with Type3 fonts and fixed various Word document rendering issues. Gnostice is pleased to announce the release of Version 5.3.17 of PDFOne (for Java), our all-in-one PDF component suite for Java SE/EE developers. In this release, we have made several enhancements and fixes in PDF processing and rendering. Gnostice is pleased to announce the release of version 5.0.0.42 of eDocEngine. This release includes improvements and fixes in metafile processor and Excel Engine. Gnostice is pleased to announce the release of XtremeDocumentStudio .NET 2016 R2. In this release we have extended MVVM support for rotation angles for pages in WPF document viewer and fixed several issues in Word formats, PDF engine and WPF document viewer. Gnostice is pleased to announce the release of XtremeDocumentStudio Delphi 2016 R3. In this release we have fixed several issues in Word formats rendering and metafile processing. .NET developers are invited to attend BASTA Spring 2016. It is taking place in Darmstadt, Hesse, Germany. The event is scheduled from 29th February to 4th March. Gnostice is happy to be among the sponsors for the event. Gnostice is pleased to announce the release of XtremeDocumentStudio .NET 2016 R1. In this release, we have extended MVVM support for navigation pane in WPF document viewer, support for rendering SDT controls in DOCX, retrieval of document properties in DOC, and made several fixes in HTML5 and WPF document viewer, and PDF rendering. Gnostice is pleased to announce the release of version 5.0.0.31 of eDocEngine. This release includes general improvements in code quality, and fixes to memory and other issues in metafile processor, PDFEngine, ExcelEngine and RTFEngine. Gnostice is pleased to announce the release of XtremeDocumentStudio Delphi 2016 R2. This release includes various Word formats rendering enhancements and fixes. Gnostice is pleased to announce the release of XtremeDocumentStudio Delphi 2016 R1. This release includes new GoToPage and ZoomTo standard actions, improved DOCX rendering in VCL and FMX and fixes for several issues with viewing, printing and report export. Gnostice is pleased to announce the release of Version 5.0.0.14 of eDocEngine, our e-document-creation and report-export component suite for Delphi/C++Builder developers. In this release, we have added support for PDF/A-1B, PDF/A-2B and PDF/A-3B report generation. In ReportBuilder export, support for barcodes and QR codes is available. Several other enhancements and fixes have also been made. Gnostice is happy to announce the official release of XtremeDocumentStudio Delphi 2015 R9. This release includes fixes for DOCX rendering and other issues encountered during the beta. Both the Ultimate edition and ReportExport edition have been updated. Gnostice is pleased to announce the release of a new edition of XtremeDocumentStudio Delphi, the ReportExport edition. The ReportExport edition includes capability to export FastReport, ReportBuilder, QuickReport and ACE Reporter reports to PDF, PDF/A, RTF, HTML, Excel and Image formats. Gnostice is pleased to announce the release of XtremeDocumentStudio .NET 2015 R21. In this release, we have made several fixes in rendering and viewing Word and PDF documents. Gnostice is pleased to announce the beta release of XtremeDocumentStudio Delphi 2015 R9. In this release, multi-format document viewer controls are available for IntraWeb. A new document view control for FastReport applications has been added. Standard file browsing controls have also been introduced. Document conversion to PDF has been added for all supported formats. Several other enhancements and fixes have been made. Gnostice is pleased to announce the release of XtremeDocumentStudio (for Java), the next-generation multi-format document-processing framework for Java SE/EE developers. In this release we have made several fixes in PDF processing. Gnostice is pleased to announce the release of Version 5.3.16 of PDFOne (for Java), our all-in-one PDF component suite for Java SE/EE developers. In this release, we have made several fixes in PDF processing. Gnostice is pleased to announce the release of Gnostice PDFOne .NET 7.2.404.1022. This release includes several fixes related to rendering of images, embedded text, and processing of PDF forms. ZoomType.FitHeight in WinForms and WPF document viewer, support in DOCX for text wrapping break character and creation of files with nested tables. We have also fixed an issue of repeated rendering of elements in nested tables. Gnostice is pleased to announce the release of eDocEngine VCL 4.0.0.654, our e-document-creation and report-export component suite for Delphi/C++Builder developers. In this release, we have added method SetColumnWidth() for setting user-defined column widths in Excel Engine. Several other internal enhancements and fixes have been made to PDF, RTF, Excel Engines, and metafile processor. Gnostice is pleased to announce the release of PDFtoolkit VCL 5.0.0.195. In this release, we have added support for AES encryption and Unicode form filling. Several fixes have also been made. Gnostice is pleased to announce the release of XtremeDocumentStudio .NET 2015 R19. In this release we have included support for rendering DOCX files with default theme when they do not contain theme data. Other minor fixes are also included. On 11 November 2015, Visual Studio Magazine announced the winners of its 22nd annual Reader's Choice Awards. The 2015 winners were chosen by the readers of Visual Studio Magazine and honor the best Visual Studio-related tools and services in 31 categories. Readers of the magazine voted for Gnostice XtremeDocumentStudio .NET and gave it the Silver medal under the "Component: Multi-Document Processing" category. The winners list will be available simultaneously on magazine website and in a special edition PDF available for download in December. We thank the readers of the magazine for voting for us. Gnostice is pleased to announce the release of Gnostice PDFOne .NET 2015 7.1.399.1013. In this release we have included several enhancements in text formatting and form-flattening functions. Several fixes in PDF rendering and processing have also been made. Gnostice is pleased to announce the release of XtremeDocumentStudio (for Java), the next-generation multi-format document-processing framework for Java SE/EE developers. In this release we have included a critical fix when working with JDK v1.6 and v1.7, and a fix related to document conversion. Gnostice is very happy to announce that Victory Fernandes, Embarcadero MVP from Brazil, will be joining our team of evangelists. Victory has done great work in a variety of areas and runs a company in Brazil specializing in industrial automation. Victory presented the Gnostice products at the Embarcadero Conference in Brazil that was held on October 21, 2015. Going forward, he will involve in creating localized content on the Gnostice products for Brazilian developers. We are happy to welcome Victory as a member of our team. Gnostice is pleased to announce the release of XtremeDocumentStudio (for Java), the next-generation multi-format document-processing framework for Java SE/EE developers. In this release we have included support for digitization on Linux OS and several fixes related to document conversion. Gnostice is pleased to announce the release of Gnostice XtremeDocumentStudio .NET 2015 R18. In this release, the dependency on BouncyCastle.Crypto.dll has been removed and some minor bug fixes have been made. Gnostice is pleased to announce the release of Version 5.3.15 of PDFOne (for Java), our all-in-one PDF component suite for Java SE/EE developers. In this release, we have made several fixes in PDF processing. Gnostice will be in Brazil next week on October 21, 2015, for the Embarcadero Conference 2015. The event will be held at Rua Pio XI, 1200 - Alto da Lapa - São Paulo. If you are in Brazil, don't miss out on this the largest conference for Delphi in the world. Gnostice is pleased to announce the release of Version 5.3.14 of PDFOne (for Java), our all-in-one PDF component suite for Java SE/EE developers. In this release, we have made several fixes in PDF processing. This session is slated for Wednesday, October 14, 2015 from 9:00am - 9:45am PDT. Gnostice invites you to attend the presentation and also participate in the Q&A following it. Gnostice is pleased to announce the release of Gnostice XtremeDocumentStudio .NET 2015 R17. In this release, the reliability of the Word engines on successive loading of documents has been improved in document viewing, printing and conversion operations. We are happy to announce the release of Version 2015 R8 of XtremeDocumentStudio Delphi, next-generation multi-format document-processing framework for Delphi/C++Builder. This release adds support for RAD Studio 10 Seattle. Gnostice is pleased to announce the release of Version 5.3.13 of PDFOne (for Java), our all-in-one PDF component suite for Java SE/EE developers. In this release, we have made several fixes in PDF processing. Gnostice is pleased to announce the release of PDFtoolkit VCL 5.0.0.170. In this release, we have introduced support for RAD Studio 10 Seattle. A new text search-and-replace API has been introduced. Gnostice is pleased to announce the release of eDocEngine VCL 4.0.0.633. In this release, we have added support for RAD Studio 10 Seattle, TRichView 16 & ScaleRichView 7. Gnostice is pleased to announce the release of XtremeDocumentStudio .NET 2015 R16. In this release, several fixes in document rendering and PDF processing have been made. Gnostice is pleased to announce the release of Version 5.3.12 of PDFOne (for Java), our all-in-one PDF component suite for Java SE/EE developers. In this release, we have made several fixes in PDF processing. Gnostice is pleased to announce the release of Version 2015 R15 of XtremeDocumentStudio .NET. In this release, we have made several fixes in viewers, mail-merge, conversion and PDF rendering. Gnostice is pleased to announce the release of XtremeDocumentStudio (for Java), the next-generation multi-format document-processing framework for Java SE/EE developers. This release includes a fix for a conversion issue that fails while converting any supported document to text document. Also we have developed a Free PDFnOffice Viewer plugin for Eclipse IDE to view document formats supported by XtremeDocumentStudio for Java. Now you don't have to leave your favorite IDE to view your project-related documents! You can also directly install it from Eclipse Marketplace. Gnostice is pleased to announce the release of Version 5.3.11 of PDFOne (for Java), our all-in-one PDF component suite for Java SE/EE developers. This release includes a fix for an issue in decompressing streams that contains white-spaces at the beginning. Gnostice is pleased to announce the release of Version 2015 R14 of XtremeDocumentStudio .NET. In this release, we have added support for text and XPS format. New API for color inversion has been introduced in HTML5 document viewer component. New customizable email sender class has been introduced in mail-merge. Apart from English, OCR feature supports other languages supported by Tesseract library, including multiple languages in the same document. Some minor bug fixes are also included. Gnostice is pleased to announce the release of Version 5.3.10 of PDFOne (for Java), our all-in-one PDF component suite for Java SE/EE developers. In this release, MouseActivityHandler is introduced to handle about mouse activity on a PDF page. Gnostice is pleased to announce the release of XtremeDocumentStudio (for Java), the next-generation multi-format document-processing framework for Java SE/EE developers. In this release, we have introduced a FREE edition comprising the Swing document viewer component. This release also includes a fix for the incorrect coordinates returned by endDigitizePage event of ConverterListener. Gnostice is pleased to announce the release of Version 4.0.0.624 of eDocEngine VCL, all-VCL e-document-creation and report-export component suite for Delphi/C++Builder developers. In this release, Rave Reports export has enhanced to automatically adjust to justify text when it goes out of bounds. Several fixes have also been made. Team Gnostice will be exhibiting in Delphi-Tage 2015 in Germany. Girish Patil will be presenting a session titled "Let's get hands-on with the Gnostice Document-Processing Framework" on 26 September 2015. 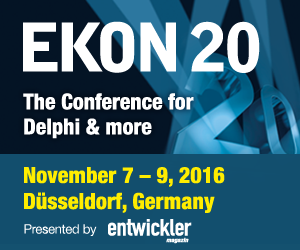 We invite Delphi customers in the region to attend and meet the team at the booth. 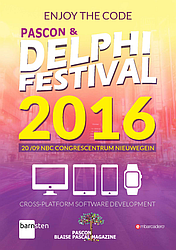 Gnostice will be participating at the The BIG Delphi Conference 2015 in Leiden, The Netherlands. The conference is scheduled for Tuesday, September 15, 2015 from 9:30 AM to 5:00 PM (CEST). Girish Patil will presenting a session titled Hands-On with the Gnostice Document Processing Framework using XtremeDocumentStudio during 1315-1415 hours. Gnostice is pleased to announce the release of Version 5.0.0.154 of PDFtoolkit VCL, our all-in-one PDF-processing component suite for Delphi and C++Builder developers. In this release, we have made several fixes related to PDF rendering and processing. Gnostice is pleased to announce the release of XtremeDocumentStudio (for Java), the next-generation multi-format document-processing framework for Java SE/EE developers. In this release, we have made a DPI fix in image-to-PDF document conversion. Gnostice is pleased to announce the release of Version 2015 R13 of Gnostice XtremeDocumentStudio .NET, the next-generation multi-format document-processing framework for .NET developers. In this release, support for check box and dropdown list form fields has been added in DOCX format. Document conversion source code demos are now available on our GitHub page. EncoderSettings now accepts extension or mime type to specify file format. Several other enhancements and fixes are included. Gnostice is pleased to announce the release of XtremeDocumentStudio (for Java), the next-generation multi-format document-processing framework for Java SE/EE developers. In this release, we have added support for specifying skew correction and a few new events and methods in document digitization API. Some signature changes have also been made in document conversion and rendering API. Gnostice is pleased to announce the release of Version 2015 R12 of XtremeDocumentStudio .NET, the next-generation multi-format document-processing framework for .NET developers. In this release, we have introduced a Visual Studio extension for viewing PDF and DOCX files within the IDE. Some other enhancements and fixes are also included. Gnostice is pleased to announce the release of Version 2015 of XtremeDocumentStudio Delphi, the next-generation multi-format document-processing framework for Delphi/C++Builder developers on VCL and FireMonkey platforms. In this release, we have added report-export interface components for QuickReport, ReportBuilder and ACE Reporter. Just by dropping one of these components to your reporting application, you can save reports to PDF, PDF/A, RTF, HTML, plain text, SVG, BMP, PNG, and other formats. PDF/A support has been enhanced with the capability to generate PDF/A 1b, 2b, and 3b, including support for PDF/A-3b generation in compliance with the electronic invoicing standard (ZUGFeRD). The other major addition in v2015 R7 is the ability to view PDF, DOCX and image files on FireMonkey mobile and desktop DataSnap applications. Gnostice is pleased to announce the release of Version 2015 R12 of XtremeDocumentStudio (for Java), the next-generation multi-format document-processing framework for Java SE/EE developers. In this release, several fixes related document viewing and PDF-processing have been made. Gnostice is pleased to announce the release of Version 5.3.9 of PDFOne (for Java), our all-in-one PDF component suite for Java SE/EE developers. In this release, all PDFOne JAR files have been digitally signed. Some fixes are also included. Gnostice is pleased to announce the release of Version 2015 R11 of Gnostice XtremeDocumentStudio .NET, the next-generation multi-format document-processing framework for .NET developers. In this release, we have added OCR technology to the document converter component. It is one of the most-requested features from our customers. Using it, rasterized text in images can be recovered when converting to a PDF. End-users will be able to search, select and copy the text in the PDF document. Several other enhancements and fixes have been made. Gnostice is pleased to announce the release of Version 5.0.0.140 of PDFtoolkit VCL, our all-in-one PDF-processing component suite for Delphi and C++Builder developers. In this release, we have introduced a new HighlightRegionShape in the PDF viewer component. The TgtPDFDocument.MaskRect() method will also automatically mask the region on any viewer component that is displaying the affected document. Adding text watermarks optimizes font resources across pages. Several other enhancements and fixes are available in this update. Gnostice is pleased to announce the release of Version 2015 R11 of XtremeDocumentStudio (for Java). In this release, we have made all our our JARs digitally signed. DOCX conversion has been enhanced to start conversion as soon as pages become available and not wait for the whole document to be parsed. Gnostice is pleased to announce the release of Version 2015 R10 of XtremeDocumentStudio (for Java), the next-generation multi-format document-processing framework for Java SE/EE developers. In this release, we have added support for asynchronous loading when viewing or converting documents. Some PDF-processing fixes are also included. Gnostice is pleased to announce the release of Version 5.3.8 of PDFOne (for Java), our all-in-one PDF component suite for Java SE/EE developers. This release fixes some issues related to PDF redaction and rendering. Gnostice is pleased to announce the release of Version 2015 R6 of XtremeDocumentStudio Delphi, the next-generation multi-format document-processing framework for Delphi/C++Builder developers on VCL and FireMonkey platforms. In this release, we have introduced a new report-export component called TgtFRExport for use with FastReport reports. Now, you can just drop the component on your report form and it will take care of interfacing with the report and export the content to several new formats including PDF, PDF/A, XLSX, RTF, HTML, XHTML, TXT, SVG, PNG, JPEG, and GIF. Wintech-Italia s.r.l. is conducting the 14th edition of their annual (Italian) Delphi Day event. Delphi Day 2015 is slated for June 11th and will be held in Piacenza, Italy. Gnostice is happy to sponsor prizes for attendees. Gnostice is pleased to announce the release of Version 2015 R10 of XtremeDocumentStudio .NET, the next-generation multi-format document-processing framework for .NET developers. In this release, we have made several fixes related to PDF rendering. Gnostice is pleased to announce the release of Version 5.3.7 of PDFOne (for Java). This release includes a fix for an issue in decompressing Flate-encoded streams. Gnostice is pleased to announce the release of Version 2015 R9 of XtremeDocumentStudio (for Java), the next-generation multi-format document-processing framework for Java SE/EE developers. In this release, we have added the ability to fine-tune the preprocessing of images to improve the OCR accuracy. Gnostice is pleased to announce the release of Version 2015 R9 of XtremeDocumentStudio .NET, the next-generation multi-format document-processing framework for .NET developers. In this release, we have added support for creating PDF portfolios as part of the document conversion methods. New events have been introduced in the HTML5 viewer so that you can get notified when a document is uploaded to a server. Support for loading a document from a Base64 string has also been included. Several fixes have also been made. Now, our customers can not only create high-quality DOCX, DOC and PDF documents, but also distribute them as high-quality PDF portfolios as well. We are also proud to ship a version ready for Visual Studio 2015. – Girish Patil, Founder & CEO, Gnostice Information Technologies. "Microsoft is committed to providing developers the tools they need to be successful across multiple platforms," said Mitra Azizirad, General Manager, Developer Platform and Marketing at Microsoft Corp. "With the latest release for Visual Studio 2015, Gnostice XtremeDocumentStudio .NET continues to provide developers a rich set of APIs to process Microsoft Office documents on multiple platforms." Gnostice is pleased to announce the release of Version 7.0.0.29 of PDFOne .NET, our all-in-one PDF component suite for .NET developers. In this release, we have made numerous enhancements and fixes related to image processing. Gnostice is pleased to announce the release of Version 2015 R8 of XtremeDocumentStudio (for Java), the next-generation multi-format document-processing framework for Java SE/EE developers. In this release, we have added support for 1-bpc Type-1 images "decode" array. Some fixes are also included. Gnostice is pleased to announce the release of Version 5.3.6 of PDFOne (for Java), our all-in-one PDF component suite for Java SE/EE developers. In this release, we have added support for 1-bpc Type-1 images with "decode" array. Gnostice is pleased to announce the release of Version 2015 R8 of XtremeDocumentStudio .NET, the next-generation multi-format document-processing framework for .NET developers. In this release, we have added a "quick search" feature in the HTML5 viewer control. This feature is supported in PDF, DOC and DOCX. In the WinForms viewer control, a thumbnail navigation pane has been added. It also supports new page layout and scrolling modes. Keyboard shortcuts for the viewer control can also be customized. In all viewer controls, we have added support for nested text boxes and tables inside text boxes. Gnostice is pleased to announce the release of Version 2015 R5 of XtremeDocumentStudio Delphi, the next-generation multi-format document-processing framework for Delphi/C++Builder developers on VCL and FireMonkey platforms. In this release, we have added support for RAD Studio X8 and made a fix related to the installer program. Gnostice is pleased to announce the release of Version 5.0.0.121 of PDFtoolkit VCL, our all-in-one PDF-processing component suite for Delphi and C++Builder developers. In this release, we have added support for RAD Studio XE8. The PDF viewer component supports different resolutions on multiple-monitor devices. There is printing and interactive form-filling support for Windows 8.1 virtual DPI scaling. The viewer component will display a "+" indicator next to text form fields when they contain more text than what they can display within their bounding boxes. Several other enhancements and fixes have been added. Gnostice is pleased to announce the release of Version 4.0.0.600 of eDocEngine VCL, all-VCL e-document-creation and report-export component suite for Delphi/C++Builder developers. In this release, we have added support for RAD Studio XE8. We have also fixed all reported memory leaks in document-creation and report-export. Gnostice is pleased to announce the release of Version 2015 R7 of XtremeDocumentStudio (for Java), the next-generation multi-format document-processing framework for Java SE/EE developers. In this update, we have also added multiple options for document conversion options, including the ability to create PDF portfolios. In document digitization, we have added the ability to apply image-enhancement techniques when to improve the accuracy of OCR-based document conversion. Several other enhancements and fixes are included. Gnostice is pleased to announce the release of Version 5.3.5 of PDFOne, our all-in-one PDF component suite for Java SE/EE platforms. In this release, we have included a few fixes related to image and colorspace-processing. Gnostice is pleased to announce the release of Version 2015 R7 of XtremeDocumentStudio .NET, the next-generation document-processing framework for .NET developers. In this release, we have added the ability to rotate pages all-at-once or individually in the WPF viewer. Several keyboard shortcuts for his page operations have been added to his WPF viewer. Gnostice is pleased to announce the release of Version 4.0.0.591 of eDocEngine VCL. This release includes the final planned enhancements to export interface installer for reliable installation of export interfaces under all conditions. The installer supports newer IDEs and report tool versions without requiring any change or recompilation of the installer source code. A issues in metafile processing and Excel spreadsheet generation have been fixed. Gnostice is pleased to announce the release of Version 2015 R6 of XtremeDocumentStudio (for Java), the next-generation multi-format document-processing framework for Java SE and Java EE developers. In this update, we have added support for Type 1 8-bpc greyscale images with "decode" array. We have also optimized the rendering of Type-1 8-bpc RGB images. Gnostice is pleased to announce the release of Version 5.3.4 of PDFOne (for Java), our all-in-one PDF SDK library for Java SE and Java EE developers. In this update, we have added support for Type 1 8-bpc greyscale images with "decode" array. We have also optimized the rendering of Type-1 8-bpc RGB images. Gnostice is pleased to announce the release of Version 2015 R6 of XtremeDocumentStudio .NET, the next-generation multi-format document-processing framework for .NET developers. In this release, we have added a new thumbnails pane to the WPF viewer control. Apart from that, additional options for page layout has been introduced. Several other enhancements and fixes are also included. Delphi gurus Ray Konopka and Cary Jensen are on a four-city Delphi tour in the United States, Europe, and Scandinavia. Each Delphi Developer Days event includes two days of Delphi sessions where Cary and Ray present both joint sessions, in which they explore in-depth topics together, as well as simultaneous tracks, where they break out into separate rooms to present diverse topics. All attendees will receive a Delphi Developer Days course book, containing more than 300 pages of material presented during Delphi Developer Days. Gnostice is happy to be among the sponsors of the tour. The ‪Australian‬ Delphi‬ User Group is holding the ADUG Autumn Symposium 2015 in ‪Melbourne‬ on the 26th March and in ‪Canberra‬ on the 27th March. Registrations are open now with early bird discounts available until the end of February. Gnostice is happy to be among the sponsors for ‪ADUG‬ Autumn Symposium 2015. Gnostice is pleased to announce the release of Version 2015 R4 of XtremeDocumentStudio Delphi, the next-generation multi-format document-processing framework for Delphi/C++Builder developers on VCL and FireMonkey platform. In this release, we have added support for interactive form-filling and also making displayed form fields data-aware. A helper class for exporting entered data to a database has also been added. Gnostice is pleased to announce the release of Version 5.3.3 of PDFOne (for Java), our all-in-one PDF component suite for Java SE and Java EE developers. In this release, we have added support for images with JFIF and EXIF data. We have also also added support for Type-1 images as SMask masking. Several fixes are included. Gnostice is pleased to announce the release of Version 2015 R5 of XtremeDocumentStudio (for Java), the next-generation multi-format document-processing framework for Java SE and Java EE developers. In this release, we have added support for images with JFIF and EXIF data. We have also also added support for Type-1 images as SMask masking. Several fixes are included. Gnostice is pleased to announce the release of Version 5.0.0.99 of PDFtoolkit VCL, our all-in-one PDF-processing component suite. In this release, we have added support for JBIG2 images with masking. Several other enhancements and fixes, most related to image-processing and digital signing are also included. Gnostice is pleased to announce the release of Version 2015 R5 of XtremeDocumentStudio .NET, our next-generation multi-format document-processing framework for .NET developers. In this release, we have redesigned document-loading logic to provide instantaneous document loading, smoother scrolling and reduced resource usage in viewer controls. 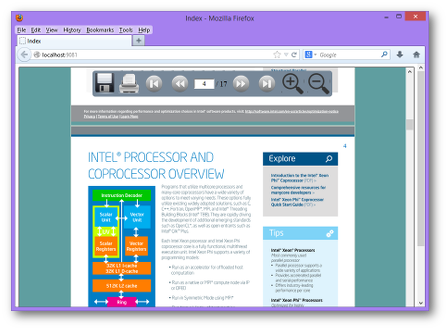 In the HTML5 multi-format document viewer, we have introduced new API to support page rotation. In the ASP.NET Web Forms document viewer, we have exposed the "HandlerUri" to specify the ASP.NET handler generating content for the viewer control. A number of fixes are also included. Gnostice is pleased to announce the release of Version 2015 R4 of XtremeDocumentStudio (for Java), the next-generation multi-format document-processing framework for Java SE and Java EE developers. In this release, we have added support for digitizing DOCX and PDF documents with scanned images. When converting such documents to PDF, the original rasterized text on the images is made searchable and selectable as text with great accuracy. This feature was introduced in the preceding release. We have also added support for Type-1 4-bpc Indexed DeviceRGB images, Type-1 1-bpc DeviceGray images, and DCT images with 1-bpc DeviceGray masking. Gnostice is pleased to announce the release of Version 5.3.2 of PDFOne (for Java), our all-in-one PDF component suite for Java SE and Java EE developers. In this release, we have added support for Type-1 4-bpc Indexed DeviceRGB images, Type-1 1-bpc DeviceGray images, and DCT images with 1-bpc DeviceGray masking. Gnostice is pleased to announce the release of Version 2015 R3 of XtremeDocumentStudio Delphi, the next-generation multi-format document-processing framework for Delphi/C++Builder developers on VCL/FireMonkey platforms. In this released, we included a number of fixes related to PDF processing. There is also a change in the prefix of the values in the enum Zoom.ZoomMode. Gnostice is pleased to announce the release of Version 2015 R4 of XtremeDocumentStudio .NET, the next-generation multi-format document-processing framework for .NET developers. In this release, we have added Web.Config options for server-side input document caching. We have also added greater MVVM support in the WPF viewer. For PDF, our viewing controls now support CCITT images with Indexed-RGB, CMYK and GrayScale colorspaces. Several fixes are also included. Gnostice is pleased to announce the release of Version 5.3.1 of PDFOne (for Java), our all-in-one PDF component suite for Java SE and Java EE developers. In this release, we have added support for CCITT images with "Indexed RGB" colorspace. Gnostice is pleased to announce the release of Version 2015 R3 of XtremeDocumentStudio (for Java), the next-generation document-processing framework for Java SE and Java EE. In this release, we have added OCR technology to the document converter component. Using this feature, text in images can be converted to a searchable PDF. Currently, it is available only on Windows and relies on a Windows native library. In future releases, additional platforms and input formats will be supported. The feature can be optionally added to your software by linking to a bundled Java wrapper of the native library. Gnostice is pleased to announce the release of Version 2015 R3 of XtremeDocumentStudio .NET, the next-generation multi-format document-processing framework for .NET developers. In this release, we have added panning ability to the HTML5 document viewer control. We have also optimized the rendering of huge multi-frame TIFF images in the Win Forms viewer control. In the recently introduced mail-merge functionality, we have added the ability to e-mail the generated documents to multiple recipients. Several other enhancements and fixes are also included. Gnostice is pleased to announce the release of Version 2015 R2 of XtremeDocumentStudio Delphi, the next-generation multi-format document-processing framework for Delphi and C++Builder developers on the VCL and FireMonkey platforms. In this release, we have added support for JBIG2 images in PDF documents. Several other enhancements and fixes are also included. Gnostice is pleased to announce the release of Version 5.0.0.80 of PDFtoolkit VCL, our all-in-one PDF processing component suite for Delphi and C++Builder developers. In this release, we have added support for JBIG2 images in 64-bit applications. We have changed the behaviour of TgtPDFDocument.GetText() so that it works well with TgtPDFViewer.GetOriginalRect() method, that is obtain text selected by the end-user on a viewer component without translating points to pixels. Several PDF viewer and processing fixes are also included. Gnostice is pleased to announce the release of Version 2015 R2 of XtremeDocumentStudio (for Java), the next-generation multi-format document-processing framework for Java SE and Java EE. In this release, XtremeDocumentStudio supports images using "Separation" colorpace with alternate "Lab" colorspace and tint-transform functions. Several fixes are also included. Gnostice is pleased to announce the release of Version 5.3 of PDFOne (for Java), the all-in-one PDF component suite for Java SE and Java EE. In this release, PDFOne supports images using "Separation" colorpace with alternate "Lab" colorspace and tint-transform functions. Gnostice is pleased to announce the release of Version 2015 R2 of XtremeDocumentStudio .NET. In this release, mail merge has been released as a full-fledged feature. It was released earlier than this as a beta/preview but in this release we have significantly redesigned it and made it more versatile and user-friendly. Apart from mail-merge, support for converting DOCX, DOC, and PDF to HTML and text has been introduced. Gnostice is pleased to announce the release of Version 2015 R1 of XtremeDocumentStudio (for Java), the next-generation document-processing framework for Java developers. In this release, we have enhanced conversion to image formats with the introduction of new options in ImageEncoderSettings. Text search and extraction methods have been enhanced. Gnostice is pleased to announce the release of Version 5.0.0.71 of PDFtoolkit VCL, our all-in-one PDF-processing component suite for Delphi/C++Builder developers. In this release, we have improved the accuracy of text search and extraction, and also optimized display of PDF forms. Several fixes are also included. Gnostice is pleased to announce the release of Version 7.0.0.283 of PDFOne .NET, our PDF component suite for .NET developers. In this release, we are bundling separate sets of DLLs targeting .NET Framework 2 and .NET Framework 4. A number of PDF-processing fixes are also included. We wish all our customers a Happy New Year in 2015. Gnostice is pleased to announce the release of Version 5.2 of PDFOne (for Java), our PDF component suite for Java SE and Java EE. In this release, we have enhanced text search methods to find search text that are broken up over two lines or pages in the document. We have also included numerous enhancements and fixes related to image processing and file attachments. We wish all our customers a Happy New Year in 2015. Gnostice is pleased to announce the release of Version 2015 R1 of XtremeDocumentStudio, the next-generation multi-format document-processing solution for Delphi/C++Builder developers. In this release, we have improved the accuracy of PDF-to-RTF conversion. Several fixes are also included. Gnostice is pleased to announce the release of Version 2014 R3 of XtremeDocumentStudio (for Java), the next-generation multi-format document-processing framework for Java SE and Java EE developers. In this release, we have added new options to the text redaction features. It can now redact text that has been broken up over two lines or pages. It also has options to remove text from other text entities such as document information properties (metadata such as title, author, keywords, et al), bookmarks and annotations, and also specify ways to deal with them if they are slated to become totally empty as a result. Gnostice is pleased to announce the release of Version 2014 R8 of XtremeDocumentStudio .NET, the next-generation document-processing framework for .NET. In this release, we have introduced a FREE edition comprising the WinForms document viewer component. We hope it will give an introduction to the power and capability of XtremeDocumentStudio to a more wider audience. The mail-merge functionality has been improved in this release. It now accepts mail-merge input data from a variety of sources - dictionary objects, data objects, etc. New options for handling input data and output targets (files and streams), and also event support have been introduced - giving more control over the entire operation. Gnostice is pleased to announce the release of Version 2014 R6 of XtremeDocumentStudio Delphi, the next-generation document-processing framework for Delphi and C++Builder developers working on VCL and FireMonkey platforms. In this release, we have added DOCX-to-text and image-to-RTF conversions. We have also added intelligent PDF-to-RTF conversion as a preview feature. Current subscribers can get these features in the latest build available from their registered downloads page. Others can use the trial builds from XtremeDocumentStudio Delphi's downloads page. Gnostice is pleased to announce the release of Version 2014 R2 of XtremeDocumentStudio (for Java), the next-generation document-processing suite for Java developers. In this release, we have introduced support for converting PDF and DOCX files to formatted text. Support for some new types of image formats are added. A few fixes are also included. Gnostice is pleased to announce the release of Version 2014 R5 of XtremeDocumentStudio Delphi, the next-generation multi-format document-processing framework for Delphi/C++Builder developers. In this release, we have added support RAD Studio XE7 Update 1. Support for PDF-to-formatted-text has been added. Several fixes are also included. Gnostice is pleased to announce the release of Version 2014 R7 of XtremeDocumentStudio .NET, the next-generation document-processing framework for .NET developers. In this updated, we have added support for mail merge (as preview) and autotext fields. Gnostice is pleased to announce the release of Version 7.0.0.260 of PDFOne .NET, our all-in-one PDF component suite. In this release, we have added a lot of fault tolerance to replicate Adobe Reader performance to badly encoded PDF documents. We have also introduced a new enumeration member to the PDFFormFieldActionType.None and made it the default action for PDFFormPushButton class. Several fixes are also included in this release. Gnostice is pleased to announce the release of Version 5.0.0.46 of PDFtoolkit VCL, our all-in-one PDF-processing component suite for Delphi/C++Builder developers. In this release, we have added support for RAD Studio XE7 Update 1. We also made Input property of custom viewer widget classes protected to provide better input control. We have also added new overloaded methods to remove annotations. Several other enhancements and fixes are also added. Gnostice is pleased to announce the release of Version 2014 R4 of XtremeDocumentStudio Delphi. In this release, we have added standard actions to the FireMonkey document viewer. This will enable you to add a viewer toolbar without writing any code for any of the supported platforms - Windows, Mac OS X, iOS and Android. Several other enhancements and fixes are also included. Gnostice is pleased to announce the release of Version 2014 R6 of XtremeDocumentStudio .NET, the next-generation multi-format document-processing framework for .NET developers. In this release, we have added support for rendering tables within headers and footers, and for tables whose columns exceed the dimensions of the page in DOCX. Several other enhancements and fixes are also included. Gnostice is pleased to announce the release of Version 2014 R3 of XtremeDocumentStudio Delphi, our next-generation document-processing framework for Delphi/C++Builder. In this release, we have included the much-awaited multi-format multi-platform FireMonkey document viewer component. 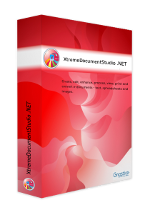 The ViewPrintConvert Edition of XtremeDocumentStudio provides support for Windows and Mac OS X targets. The Ultimate edition adds support for iOS and Android targets. This release also includes support for RAD Studio XE7. Customers who have current Gnostice XtremeDevSystem Delphi or XtremeDocumentStudio Delphi subscriptions can get this update free from their registered download pages. Others can get a trial build from our downloads page. A novel feature that we added in this release is the optional integration with Gnostice StarDocs, our REST-based and cloud-based document-processing server. On mobile devices such as phones and tablets, developers have the option to offload document-processing work to a StarDocs server. This functionality can be enabled simply by adding a bundled StarDocs-specific unit to your project and setting the user key settings for the StarDocs server. No change to the business logic of your product is required. StarDocs can be hosted on your in-house server or on a Gnostice server. Integration with StarDocs also adds support for DOCX format to XtremeDocumentStudio“Integration with StarDocs also adds support for DOCX format to XtremeDocumentStudio's FireMonkey document viewer for all devices – Windows, Mac OS X, iOS, and Android. Gnostice is pleased to announce the release of Version 5.1 of PDFOne (for Java), our all-in-one PDF component suite for Java developers. In this release, we have added support for rendering various combinations of image formats found in the wild. We have added new API for content creation and text search. We have added support for embedding Type 1 fonts (*.pfb). We have also optimized text redaction and empty-page detection. Support for automatically e-mailing the saved document is now available. Numerous fixes are also included. Embarcadero is hosting a 3-day online conference for Delphi/C++Builder developers. Gnostice is proud to take part in it. Gnostice founder and CEO Girish Patil will be presenting a technical session titled "Working with PDF and Office Documents using VCL and FireMonkey" - in the Object Pascal track as well as the C++Builder track. In this session, we take a deep look into the all-new multi-format document-processing toolset for Delphi/C++Builder from Gnostice. We take a brief look at architectural details of the product and then go into using the product. You'll get to see real code examples for viewing, printing, converting and processing documents in Delphi VCL and FireMonkey on desktop and mobile devices. You'll also see examples of document processing using StarDocs, the new Gnostice REST-based document server. Gnostice is pleased to announce the release of a new product - XtremeDocumentStudio (for Java), the next-generation multi-format document-processing library for J2SE/J2EE platforms. In this first release, XtremeDocumentStudio supports viewing, printing and conversion of DOCX, PDF, BMP, PNG, JPEG, JPEG2000, and single-page multi-page TIFF formats. Additionally, special PDF processing ability is also available - merging, splitting, encryption and text redaction. Gnostice is pleased to announce support for Delphi XE7 in eDocEngine VCL version 4.0.0.487. eDocEngine is our e-document-creation and report-export component suite for Delphi/C++Builder developers. We have also introduced new API for specifying opacity for images, shapes, and text. A number of other enhancements and fixes have also been added. Our team is working on a C++Builder compilation issue that has cropped up with XE7. They will be updating the builds, as soon as that issue is resolved. Gnostice is pleased to announce the release of Version 5.0.0.16 of PDFtoolkit VCL, our PDF component suite for Delphi/C++Builder. In this release, we have added support for RAD Studio XE7. Gnostice is pleased to announce the release of XtremeDocumentStudio 2014 R5. In this release, we have added a navigation pane in WPF document viewer component. The navigation pane supports bookmarks in PDF documents. Source code demos have been updated for document conversion in WPF and MVC (ASPX and Razor engines). Gnostice is pleased to announce the availability of online demos for testing our products. These demos are available at DEMOS.gnostice.com. Currently, .NET demos (those of XtremeDocumentStudio .NET and PDFOne .NET) are available. In future, other products will find their way there. 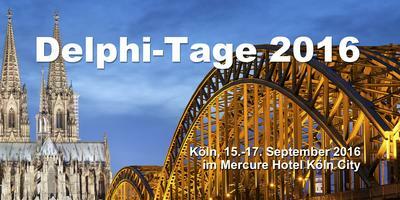 In September, Team Gnostice will be in Germany to exhibit our advanced document-processing technologies at two developer conferences - Delphi-Tage (September 4-6, 2014) and BASTA! (September 22-25, 2014). Delphi-Tage is a popular annual event organized by the Delphi community in Germany. On September 5, 2014, Team Gnostice will be conducting a workshop on "PDF and Office document processing on desktop and mobile devices" at The Hilton Hotel. The team will also be exhibiting our new products at the main event on September 6, 2014 and also making a presentation titled "Working with PDF and Office documents using Delphi VCL and FMX." The main event will take place at The National Museum in Bonn. BASTA! is a premier event for .NET developers in German-speaking regions of Europe. BASTA! will take place at the Rheingoldhalle in Mainz between September 22 and 25. The Gnostice team will be showcasing our new and advanced PDF and Office document processing technology, XtremeDocumentStudio .NET, at the conference. The expo part of the conference is scheduled for September 23-25. If you are attending any of these events, we invite you to meet our team and learn more on exciting new tools that you can use to develop great apps. Gnostice is pleased to announce the release of XtremeDocumentStudio .NET 2014 R4. This release includes a brand-new ASP.NET MVC multi-format document viewer control (only in Ultimate edition), PDF viewing in WPF control, intelligent PDF-to-DOCX conversion (both Ultimate and ViewPrintConvert editions), faster PDF loading, and several other improvements and fixes. Gnostice is pleased to announce the release of Version 5.0.0.9 of PDFtoolkit VCL, our PDF component suite for Delphi/C++Builder. In this major update, we have added 64-bit compatibility in Delphi/C++Builder XE2 and later versions. This has been made possible by creating a 100% Delphi font engine written from the ground up. The search-and-highlight feature has been improved in the TgtPDFSearchPanel component. TIFF processing issues using GDI+ in C++Builder have been fixed. Several other enhancements and fixes are also included. Gnostice is pleased to announce the release of eDocEngine VCL 4.0.0.456. In this update, we have made numerous fixes to the PDF, XLSX and XLS engine components and FastReport export interface component. Gnostice is pleased to announce the release of Version 4.0.0.56 of eDocEngine VCL, our e-document-creation and report-export component suite. In this update, we have added support for RAD Studio XE6 Update 1. Gnostice is pleased to announce the release of Version 4.0.1.462 of XtremePDFConverter VCL, our advanced PDF-to-RTF conversion library for Delphi/C++Builder. In this update, we have added support for RAD Studio XE6. It also includes the latest version of our internal PDF processor. Gnostice is pleased to announce the release of Version 4.0.1.462 of PDFtoolkit, our PDF component suite for Delphi/C++Builder. In this update, we have added support for RAD Studio XE6 Update 1. PDFToolkit source has been made compatible with Delphi 5. A new Destination property has been added to link annotation classes for linking to targets within the same document. A new optional Password parameter for TgtPDFDocument.LoadFromFile and TgtPDFDocument.LoadFromStream methods has been added. A few other enhancements and fixes have been added. Gnostice is pleased to announce the release of Version 4.0.0.451 of eDocEngine VCL, our multi-format document-creation and report-export component suite for Delphi/C++Builder. In this update, we have added support for the GEDI GIF library. Big improvements in XLS-creation creation speeds have been made. Several fixes are included. Gnostice is pleased to announce the release of XtremeDocumentStudio .NET. In this release, we are introducing a new "Ultimate" edition in addition to the existing ViewPrintConvert edition. This new edition will be made available free for current subscribers of XtremeDevSystem .NET. The Ultimate edition will feature a new AJAX-powered ASP.NET document viewer component. New document creation and editing API are also included in the Ultimate edition. 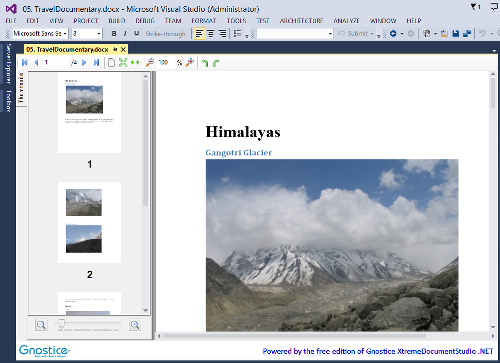 A new WPF document viewer control has been introduced for both editions. Gnostice is pleased to announce the release of Version 4.0.1.422 of XtremePDFConverter VCL. In this release, we have added support for RAD Studio XE6. Gnostice has added support for RAD Studio XE6 in Version 4.0.1.440 of PDFtoolkit VCL released today. In this release, we have also added support additional languages in the setup program. Numerous fixes have also been made. Gnostice is pleased to announce the release eDocEngine VCL 4.0.0.432. In this update, we have added support for RAD Studio XE6. Some new properties have been introduced to specify image scaling in report-export with Fast Report. Several fixes are also included. Gnostice is pleased to announce support for RAD Studio XE6 in XtremeDocumentStudio Delphi 2014 R2. A few enhancements and fixes have been made to the installer. Team Gnostice will be visiting Houston, Texas, and we invite you to come and meet us at booth #335 of the Tech Expo. We will be exhibiting our new range of .NET products on all days of the event - May 12 to 15. It will be a good opportunity to learn more about our products and interact with the development team. Also, this time, the Team will be taking some time off before the event to get involved in community rebuilding activities. We expect it to be fun all the way! Delphi Developer Days 2014 is here again. Delphi gurus Cary Jensen and Bob Swart are on a five-city Delphi tour in the United States, Europe, and the United Kingdom. Gnostice is happy to be a Gold sponsor again this year. Attend and learn from the best. Win prizes from the sponsors and have a good time. Gnostice is pleased to announce the release of Version 4.1.0.126 of PDFOne .NET, our PDF component suite for .NET developers. In this version, we have made improvements to the ASP.NET PDF Viewer and PDF-creation abilities. The ASP.NET PDF Viewer now has a built-in password-prompting dialog box. New table-creation API has been introduced in PDFDocument component. Several fixes have been made. Gnostice is pleased to announce the release of XtremeDocumentStudio .NET 2014 R2. In this release our next-generation multi-format document processing suite for .NET developers includes enhanced support for DOC (Word 97-2003) binary format - lists, tables, headers and footers. This update also brings rotation support for the viewer component. Gnostice is pleased to announce the release of 4.0.0.428 of eDocEngine VCL, our document-creation and report-export component suite for Delphi/C++Builder. In this update, we have added a new property in ScaleRichView export component to expose its rendering options. Issues related to 64-bit support in C++Builder have been fixed. Several other fixes have been made. Gnostice is pleased to announce the release of Version 4.0.0.396 of eDocEngine VCL, our multi-format document-creation and report-export component suite for Delphi/C++Builders developers. In this update, we have reviewed and updated supported for C++Builder 2007, 2009, 2010, XE, XE2, XE3, XE4 and XE5. We have added Indy adapter packages for older versions of Delphi (6 through XE). eDocEngine now supports QuickReport 5.05 and 5.06. Embarcadero is conducting a virtual (online) conference for C++Builder community. CodeRage C++ is slated for February 25/26. Gnostice founder and CEO will presenting a session titled "PDF and Office document processing tools for C++" on February 26, 2014, from 9:00am to 9:45am PST. In this session, C++Builder developers can learn about native all-new multi-format document-processing toolset for C++ from Gnostice. We'll look at the architectural details of the product first and then go into using the product. Developers will get to see real code examples for viewing, printing, converting and processing electronic documents (PDF, DOCX, and image formats) in C++, using the new Gnostice tools. BASTA! is a premier must-attend event for .NET developers in Europe. The event is slated to be held from 24th to 28th in February. Gnostice is honoured to be a bronze sponsor for their Spring 2014 edition. For more information, visit: www.basta.net. Gnostice is pleased to announce the release of Version 2014 R1 of XtremeDocumentStudio .NET, the next-generation multi-format document-processing framework for .NET developers. In this update, we have added support for DOC (Microsoft Word 97-2003) format. In DOCX rendering, we now support nested tables, underlined text, and all-caps text style. Today, we have released XtremeDocumentStudio Delphi 2014 R1, an update to the next-generation multi-format document-processing framework. 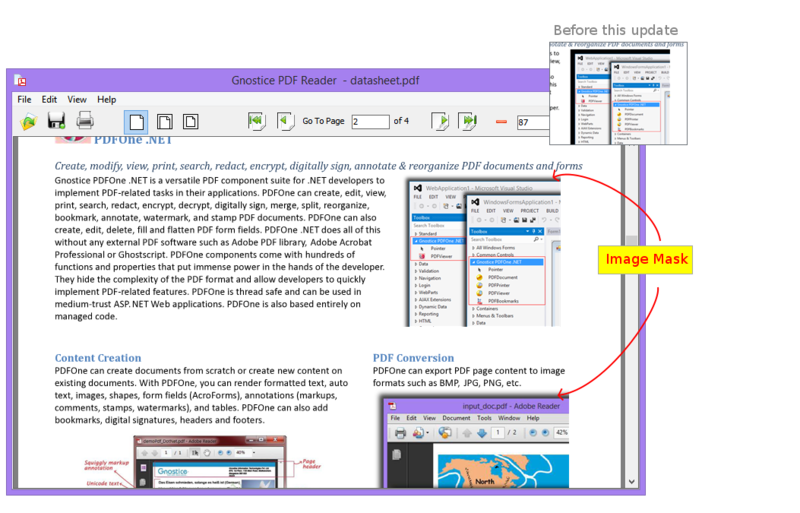 XtremeDocumentStudio includes enhancements made to the PDFtoolkit viewer in a recent update including support for rendering masked images. A new extensible navigation pane system has been introduced in the multi-format viewer - currently supporting end-user interactivity and page navigation with PDF bookmarks. Gnostice is pleased to announce the release of Version 4.0.1.395 of PDFtoolkit VCL. In this release, we have added support for ColorKey masked images. A new method MovePage has been introduced in TgtPDFDocument class to rearrange individual pages. A couple of fixes are also included. Gnostice is pleased to announce the release of Version 4.0.1.395 of PDFtoolkit VCL, our PDF-processing component suite. In this update, we have added support for rendering images with image masks. A new method to set XML meta data for a PDF document has also been added. Several other enhancements and fixes are also included. Gnostice is pleased to announce the release of Version 4.0.0.357 of eDocEngine, our multi-format document-creation and report-export component suite. In this update, we have added a new engine for generating XLS spreadsheets (Excel 95-2003). This version also adds support for RAD Studio XE5 Update 2. Many other enhancements and fixes are also included. Gnostice is pleased to announce the release of Version 6 of PDFOne .NET, our PDF component suite for .NET developers. In this release, we have introduced the much-awaited ASP.NET PDF viewer component. ASP.NET Web Forms applications built using PDFDocument component can run in medium trust environments. Many other enhancements and fixes are included. Gnostice is pleased to announce the release of Version 2013 R4 of XtremeDocumentStudio .NET, the next-generation multi-format document-processing framework for .NET developers. In this release, we have introduced a separate document printer component. Earlier, printing functionality was in the document viewer component. The viewer component still has the printing functionality. It now prints asynchronously and does not hold up the UI thread. A DocumentConverter component is now available for converting documents. A few fixes have also been included. Gnostice is pleased to announce the release of Version 2013 R2 of XtremeDocumentStudio Delphi, the next-generation document-processing framework for Delphi/C++Builder developers. In this version, we have made numerous enhancements to DOCX and PDF rendering and processing. Several fixes are also included. Some name changes in the API have also been made. Today, Gnostice Information Technologies released XtremeDocumentStudio .NET 2013 R3. This update adds new features and support for Visual Studio 2013. “The vision for XtremeDocumentStudio is to provide an integrated native multi-format document-processing technology for implementing all kinds of document-processing functions in business applications. We are glad today that this next-generation product supports the latest version of Visual Studio 2013,” said to Girish Patil, Founder & CEO, Gnostice Information Technologies. “Gnostice XtremeDocumentStudio provides developers using Visual Studio a single, unified framework for easily implementing advanced document-processing tasks in their applications,” said Mitra Azizirad, General Manager, Developer Tools Marketing and Sales, Microsoft. "Enabling applications to render and accurately process Microsoft documents and other file formats while using a single .NET library creates a rich experience and increases value for users." Apps.Gnostice.com ready for public beta! A few months ago, we started a new project to showcase the functionality of our PDF and Office document-processing libraries through a web app that anybody could use - not just developers or PC users. We wanted to demonstrate the functionality of Gnostice developer libraries through this app. This effort has greatly helped us optimize our core PDF and document-processing libraries. We also use it as our own office-on-the-go for PDF documents! Currently, the app supports merging, splitting, converting and redacting PDF documents. Use it anytime anywhere. It is free! Please visit apps.gnostice.com. Gnostice Apps is powered by our Java PDF library Gnostice PDFOne (for Java). Gnostice is pleased to announce the availability of 5.1.0.130 of PDFOne .NET, our all-in-one PDF component suite for .NET developers. In this update, we have added support for Visual Studio 2013, the latest version of the popular IDE from Microsoft. Gnostice congratulates Stefan Schaefer of HR.de for winning the iPad mini raffle at BASTA! Fall 2013. We are really pleased to release XtremeDocumentStudio Delphi, the next-generation document-processing library for Delphi/C++Builder developers. The vision with XtremeDocumentStudio is to enable software creators to implement every process and function with electronic documents, their business applications need to get done, by providing an integrated, native, multi-format document-processing technology. We are glad today to release the first version of this next-generation product. Delphi gurus Bob Swart and Cary Jensen will be in London for the 2013 edition of Delphi Developer Days. This unique three-day event that includes the classic Delphi Developer Days sessions plus an optional hands-on Mobile Development Workshop the third day. Gnostice is happy to support the event as a Gold Sponsor and hopes Delphi lovers will make the best of sessions. Please visit www.delphideveloperdays.com for more information. Gnostice is pleased to announce the release of Version 4.0.0.251 of eDocEngine VCL, our multi-format document-creation and report-export component suite for Delphi/C++Builder developers. In this update, we have added support for Embarcadero RAD Studio XE5. We have also included several fixes and some enhancements. Gnostice is pleased to announce the release of Version 4.0.l.364 of PDFtoolkit VCL, our PDF component suite for Delphi/C++Builder developers. In this update, we have added support RAD Studio XE5. Numerous enhancements and fixes related PDF rendering and processing are also included. Gnostice founder and CEO Girish Patil will be presenting a session titled "PDF and Office Document Processing Tools for Delphi from Gnostice" at the CodeRage 8 Virtual Conference. The Gnostice session is scheduled for Wednesday, October 16, 2013, between 5 a.m. and 5.45 a.m PDT. 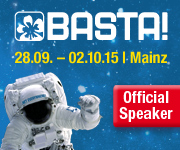 Team Gnostice is pleased to announce that it will be in Germany to participate in BASTA! 2013 and Delphi-Tage 2013. At Delphi-Tage, Girish Patil and Ramnish Radhakrishnan will be presenting a session titled "Next generation PDF and Office document processing tools for Delphi from Gnostice". We invite you attend our session and also visit our stand and meet the team. Gnostice has released Version 2013 R2 of XtremeDocumentStudio .NET today. In this update, DOCX engine now renders tables with support for	cell alignment, cell margins, cell spanning, shading and styles hierarchy. Support for rendering large tables with rows split across	pages, and repeating rows across pages has also been added. Several other enhancements have been included. Gnostice is pleased to announce the release of Version 4.0.0.200 of eDocEngine VCL. In this update, we have included a completely revamped Export Interface Installer with support for adding new IDEs and report engine versions through the DB (without having to recompile installer application). It is also more fault tolerant of misplaced files by reporting engine installers. Users can modify the DB using a customization application (gtExpIntfDB.exe). Many fixes are also included. Gnostice is pleased to announce the release of Version 4.0.1.337 of PDFtoolkit, our PDF component suite for Delphi/C++Builder programmers. In this release, we have improved the rendering performance of the viewer and printer components by using optimized caching mechanism. We have also added new API to control the caching mechanism. Several end-user interface improvements and conveniences have been made in the viewer and search panel components. Numerous other enhancements and fixes have been made. Gnostice is pleased to announce the release of Version 4.0.1.302 of XtremePDFConverter VCL, our VCL library for intelligently converting PDF documents to user-friendly Word RTF documents. In this update, we have added support for Embarcadero RAD Studio XE4. Gnostice is pleased to announce the release of Version 4.0.1.293 of PDFtoolkit VCL. In this version, we have added support for RAD Studio XE4. It also includes some fixes related to text extraction and JBIG2 image rendering. Gnostice is pleased to announce the release of Version 4.0.0.154 of eDocEngine VCL. This update adds support for the new RAD Studio XE4. A few fixes related to the text engine are also included. Gnostice is pleased to announce the release of Version 4.0.0.150 of eDocEngine VCL. In this update, the HTML and XHTML engines generate W3C-compliant output. We have also added support for RaveReport 11 in Delphi/C++ Builder XE3. A number of other fixes are also included. Gnostice is pleased to announce the release of Version 4.0.1.283 of PDFtoolkit VCL. This update include numerous fixes related to PDF processing and rendering. Gnostice is pleased to announce the release of Version 5.1.0.61 of PDFOne .NET. In this update, we have eliminated the use of FontList.xml and FontListMakerConsole.exe. The PDFFont.FontListFile property is now deprecated. Other updates include support for various forms of image masking and several fixes. Gnostice is pleased to announce the release of Gnostice XtremeDocumentStudio .NET 2013 R1. In this release, we have new non-GUI control named DocumentManager for programmatic processing of documents - convert multiple files in various formats using a single instance. We have also added viewing and printing support for image formats such as BMP, PNG, JPEG, WMF, EMF and TIFF. Gnostice is pleased to announce the release of Version 4.0.0.135 of eDocEngine VCL. In this update, we have added numerous enhancements and fixes to the Excel engine. Several fixes related to report-export to PDF have been made. Gnostice is pleased to announce the release of Version 4.0.1.271 of PDFtoolkit VCL. In this update, we have added support for JPX image rendering in the PDF viewer and printer components. The setup now installs LIB and OBJ files required for C++Builder-only environments. Several fixes are also included. Gnostice is pleased to announce the winner of the iPad mini raffle at BASTA! Spring 2013 - Thomas Ramm. Our team concluded a successful visit to the conference and wishes to thank all attendees to our session and visitors to our booth. Gnostice is proud to announce that it will be participating in BASTA .NET Spring 2013 conference. Gnosticians Shivaranjini and Santhanam will be presenting a session on 27th February between 1015 hrs and 1130 hrs in the Königswinter room. In this hands-on session, the goal will be to develop a Windows 8 application for exploring Microsoft SkyDrive and viewing documents. Attendees will go through the live development step-by-step and learn about some basic Live SDK API to browse and access SkyDrive documents, and use Gnostice REST Web APIs to view the documents. Gnostice is pleased to announce the release of Version 4 of eDocEngine VCL, our multi-format document-creation component set for Delphi/C++Builder developers. This new version enables developers to create documents in Microsoft XLSX spreadsheet format with Unicode support. On-the-fly digital signing for PDF engine has been introduced. Automatic image de-duplication is supported in PDF, HTML, XHTML and XLSX engines. A new e-mail adapter component has also been introduced to make it easy to integrate a mailing component. 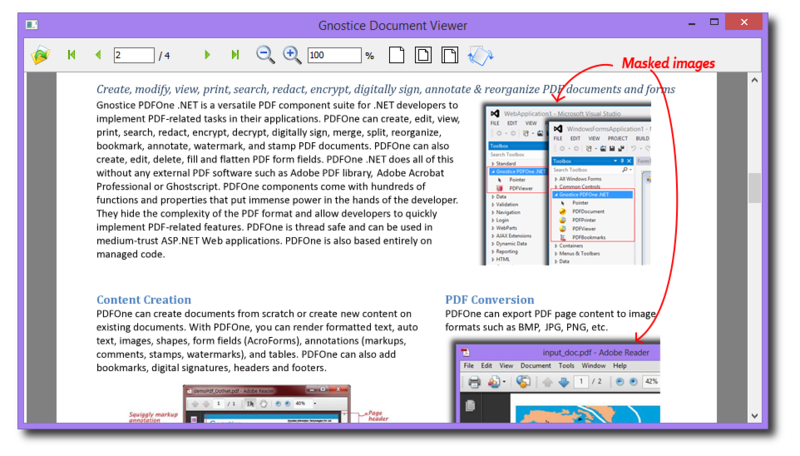 Gnostice is pleased to release Version 5 of PDFOne .NET, our all-in-one PDF component suite for .NET. In this release, we eliminated external DLL and CMAP file dependencies, added support for viewing/printing JBIG2 image data, and included several enhancements and fixes. Gnostice is pleased to announce the release of Version 4.0.1.235 of XtremePDFConverter VCL, our VCL component for intelligently converting PDF documents. In this release, we have added support for RAD Studio XE3. Gnostice is pleased to announce the release of Gnostice PDFtoolkit VCL 4.0.1.235. In this release, we have optimized the PDF viewer component to provide a fluid page-scrolling experience for the end-user. Several new methods related to form fields processing. Gnostice is pleased to announce the release of XtremeDocumentStudio, the next-generation multi-format document processing technology for .NET developers. XtremeDocumentStudio is the culmination of years of experience we have gained creating tools for developers to work with electronic documents. We have taken all the feedback we received from customers who use our products across all the programming platforms we support and in combination with our vision for document processing developer tools, we have created XtremeDocumentStudio: The ultimate multi-format document processing toolset for .NET developers. The goal was to create a single toolset for enabling developers to perform every kind of document processing task, end-to-end, whether it be creating a document, editing, viewing, printing, converting or any other function that a business application needs to perform on a document, and be able to work with multiple document formats within the same toolset. We decided to tackle the most difficult task for the first release that is of processing the DOCX and PDF formats to support the viewing and printing functions. The XtremeDocumentStudio 2012 R1 release does a great job, and we can say this with confidence, in the area of viewing and printing DOCX and PDF documents and a single viewer control supports both formats. Gnostice is pleased to announce the release of Version 3.0.4.366 of eDocEngine VCL. In this release, we have added support for RAD Studio XE3 and Report Builder 14. A few bug fixes are also included. Gnostice is pleased to announce the release of Version 4.0.1.200 of PDFtoolkit. In this version, we have added support for RAD Studio XE3. We have also added a few other enhancements and fixes. Gnostice is pleased to announce the release of PDFtoolkit VCL Version 4.0.1.169. In this release, we have made numerous enhancements and fixes related to document rendering and form fields processing. We have also added "tab-key" navigation support for the end-user in the PDF viewer component. Gnostice is pleased to announce the release of PDFOne (for Java) Version 5.0.0.123. In this release, we have introduced new overloaded text search methods and have also made included several fixes. Gnostice is proud to announce that it will be participating in BASTA! 2012 and Delphi Tage 2012 as a presenter, an exhibitor, and a sponsor. The BASTA! is the largest independent developer conference for Microsoft technologies in Germany. Delphi Tage is a popular event among Delphi developers. Gnostice invites developers to its session titled PDF and Microsoft Word Documents: Knowing more about the formats and the possibilities for application. We invite you to attend and meet the team at our booth. Gnostice Partners With Barnsten B.V.
Gnostice Information Technologies has partnered with Barnsten B.V. of The Netherlands for a stronger local presence in the Benelux region (Belgium, Holland and Luxembourg). Barnsten will coordinate all marketing, sales, and customer-support activities for Gnostice in the Benelux region. For more than 15 years, Barnsten has been serving the developer community - enabling them increase productivity, improve software quality, enhance application and database performance, streamline compliance and security efforts, and reduce costs. If you are from the Benelux region, you can contact Barnsten (+31 23 5422227 or sales@barnsten.com) for purchasing of Gnostice products. If you have any sales or product-related questions, Barnsten will be pleased to help you. Gnostice is pleased to announce the release of Version 4.1 of PDFOne .NET, our PDF component library for .NET platform. In this release, we have added support for digital signatures. New overloads for text search methods have also been introduced. Gnostice is pleased to announce the release of Version 3.0.4.290 of eDocEngine VCL, our multi-format document creation and report-export component suite for Delphi/C++Builder. In this release, we have released fixes for numerous PDF export issues. Gnostice is pleased to announce the release of Version 4.0.1.145 of XtremePDFConverter VCL, an intelligent PDF-to-RTF converter library for Delphi/C++Builder. In this release, we have added support for RAD Studio XE2. Gnostice is pleased to announce the release of Version 4.0.1.145 of PDFtoolkit, our PDF component suite for Delphi/C++Builder. In this minor update, we have released fixes for several issues. Gnostice is pleased to announce the release of Version 4.0.1.129 of PDFtoolkit VCL. In this release, we have fixed all known memory leaks related PDF rendering. Several other issues have also been fixed. Gnostice is pleased to announce the release of PDFOne .NET 4. Highlights of this release include: a native .NET font engine; text extraction, redaction and search; 128-bit AES encryption support and page elements parsing. In this release, we have replaced the (unmanaged) FreeType library with our own 100% .NET font engine - XtremeFontEngine .NET. As a result, PDFOne can render PDF text faster than it did earlier. This change also makes PDFOne a 100% pure .NET component suite. You can now use PDFOne components in all .NET environments without all the hassle caused by unmanaged dependencies. Gnostice is pleased to announce the release of PDFOne Version 5. Highlights of this release include the pure Java font engine and support for digital signing. In this release, we have replaced the non-Java FreeType library with our own 100% Java font engine - XtremeFontEngine (for Java). This makes PDFOne a 100% pure Java component suite. You can now use PDFOne components in all Java environments without all hassles related to using non-Java dependencies. Gnostice is pleased to announce the release of Version 4.0.1.122 of PDFtoolkit. In this release, we have added support for RAD Studio XE2 Update 3. A few enhancements related to text extraction and interactive form filling have been made. Several fixes are also included. Delphi gurus Marco Cantù and Cary Jensen are on the road again with their Delphi Developer Days 2012. Gnostice wishes them great success. Gnostice is proud to be associated with the tour as a Gold Sponsor. More information is available at DelphiDeveloperDays.com. Gnostice is participating in CeBIT 2012 as an exhibitor. We will be showcasing XtremeDocumentStudio, XtremeFontEngine .NET, XtremeFontEngine (for Java), XtremePDFConverter VCL, eDocEngine VCL, PDFtoolkit VCL, PDFOne .NET v5, and PDFOne (for Java) v5. We are pleased to invite our current and prospective customers and partners to our stand E18 in Hall 6. This will be a good occasion to check out our new products, meet the team and exchange ideas. The exhibition is scheduled from March 6 to March 10. Gnostice is pleased to announce the release of Version 3.0.4.269 of eDocEngine, our multi-format document-creation engine for Delphi/C++Builder. In this version, we have added support for ScaleRichView version v4.3.4 and later versions in Delphi 2009/2010/XE/XE2. Several other enhancements and fixes are included. Gnostice is pleased to announce the release of PDFOne .NET v3.0.8. In this update, we have made several fixes related to form fields. The PDF document component's EmailAfterSave option is now available for documents that are saved to a stream. Several other enhancements and fixes are included. Gnostice is pleased to announce the release of the first version of XtremeFontEngine (for Java). XtremeFontEngine is a 100% Java font engine that allows you to render several types of fonts, even those that are not supported by the JRE framework. XtremeFontEngine supports Type 1, Type 2 (CFF), and TrueType fonts. We also have written a whitepaper on font rendering for Java developers. Gnostice is pleased to announce the latest addition to our roster of developer tools - XtremeFontEngine.NET. XtremeFontEngine .NET. XtremeFontEngine is a 100% .NET font engine that allows you to render several types of fonts, even those that are not supported by the .NET framework. XtremeFontEngine supports Type 1, Type 2 (CFF), and TrueType fonts. We also have written a whitepaper on font rendering for .NET developers. Gnostice is pleased to announce the release of the pre-release demos for XtremeFontEngine .NET. XtremeFontEngine .NET is a 100% .NET font engine that allows you to render several types of fonts, even those that are not supported by the .NET framework. We have an online demo and a desktop executable demo for demonstrating the capabilities of XtremeFontEngine. Gnostice is pleased to release Version 4.0.1.97 of PDFtoolkit VCL, our PDF component suite for Delphi/C++Builder. In this update, we have improved text extraction and the accuracy of PDF viewer interactivity. A number of fixes are also included. Gnostice is pleased to announce the release of PDFOne .NET v3.0.7. In this update, we have added the ability to read and edit PDF actions specified for PDF bookmarks. Support for rendering transparent GIF and PNG images has been added to the PDF document component. A number of fixes have also been included. Gnostice is pleased to announce the release of Version 4.0 of PDFOne (for Java™), our PDF component suite for J2SE and J2EE platform. Highlights of this major update include support for JBIG2 rendering, AES 128-bit encryption, page elements extraction, text redaction, formatted text extraction, and advanced/incremental text search. A number of enhancements and fixes are also available. Gnostice is pleased to release Version 4.0.1 of PDFtoolkit VCL, our PDF component suite for Delphi/C++Builder. In this update, we have added keyboard support to the viewer component. Several new methods and properties have also been added. The viewer demo has been updated to demonstrate the use of a custom annotation widget. A number of other enhancements and fixes have been made. Gnostice is pleased to announce the release of Version 3.0.4.263 of eDocEngine. In this update, the Export Interface Installer program has been updated. It can now install the interface component for Rave Reports in RAD Studio XE2. Gnostice is pleased to announce the release of Version 4 of PDFtoolkit, our PDF component suite for Delphi/C++Builder. The major highlight of this version is the interactive PDF viewer. It has support for AcroForms and user-defined widgets. API for exporting PDF pages to a variety of image formats is now built in. This update adds support for RAD Studio XE2 (both 32-bit and 64-bit Windows). It also supports C++Builder versions 2007 to XE2. Gnostice is pleased to announce that it will be presenting a session titled "Exploring the new Gnostice PDFtoolkit 4 for Delphi Win 32/64." The session will be live on Friday, October 21, between 7:00 am and 7:45 am PDT. Gnostice is pleased to announce the release the fourth preview of PDFtoolkit Version 4. A highlight of this preview is the PDF viewer support for end-user interactivity and the ability to add user-defined widgets for PDF page elements. Gnostice is pleased to release Version 3.0.4.255 of eDocEngine VCL, our document/image/spreadsheet engine and Delphi report-export component suite. A highlight of this release is support for RADStudio XE2. Gnostice is pleased to announce the release of PDFOne v3.5.4, our PDF component suite for Java developers. In this release, we have added the ability to specify page rotation in the document component. There are some new PDF printing features that you might like very much. A number of fixes are also included. Gnostice is pleased to announce the release of Version 3.4.8.240 of PDFtoolkit, our PDF editing component suite for Delphi/C++Builder developers. This update adds support for rendering rotated text, and several other enhancements and fixes. Gnostice is pleased to announce the release of Version 3.4.8.235 of PDFtoolkit VCL, our PDF component suite for Delphi/C++Builder platform. This update brings highly improved text extraction and a number of fixes. Gnostice is pleased to announce the release of Version 3.0.3.236 of eDocEngine VCL, our document-creation and report-export component suite for Delphi/C++Builder developers. This release includes a number of fixes related to PDF creation, QuickReport export, and the recompiler utility. Gnostice is pleased to announce the release of Version 3.4.8.233. A highlight of this release is enhanced support for JBIG2 images and CID fonts. Several other enhancements and fixes are also included. Gnostice is pleased to release Version 3.4.7.223 of PDFtoolkit VCL, our PDF component suite for Delphi and C++Builder platform. This release adds support for JBIG2 images. There is also a new PDF viewer demo for adding watermarks interactively. Gnostice is pleased to release Version 3.0.3.218 of eDocEngine. This update includes a rewritten TIFF engine and several fixes. Gnostice is pleased to release Version 3.5.3 of Gnostice PDFOne (for Java), our PDF component suite for the Java platform. In this release, we have made several enhancements and fixes. PDF viewer, printer and document component now provide more control over rendering options. You can also specify your own custom substitute fonts for PDF fonts that are neither embedded in the document nor available in the fonts subsystem. If you use the PDF printer component, then now you can choose between the the native Print dialog or the or cross-platform Java dialog. Gnostice is pleased to release Version 3.0.6 of PDFOne .NET, the latest update to our all-in-one PDF component suite for .NET developers. In this version, we enhanced support for PDF form fields. Gnostice is proud to be associated with the tour as a Gold Sponsor. More information is available at DelphiDeveloperDays.com. Gnostice is pleased to announce the release of Version 3.0.2.209 of eDocEngine. This update includes several fixes related to report-export components. The setup also installs a new help file and provides F1-key integration in the IDE. Gnostice is pleased to announce the release of version v3.0.1.205 of eDocEngine VCL, our document- creation component suite for Delphi/C++Builder developers. This version contains several enhancements and fixes related to rendering of metafiles and reports. We are pleased to release eDocEngine VCL v3.0.1.193. A highlight of this release is support for automatic substitution of digits in Latin script to Arabic script in Arabic locale. This version also fixes the transparency issue when exporting to PDF from DevExpress Printing System; the text overlapping issue when using strings with both right-to-left and left-to-right "bidi" modes; and the "Index out of bounds" error when text elements are excluded in the "ItemToRender" property. Gnostice is pleased to release Version 3.4.7.207 of PDFtoolkit VCL. This release fixes issues related to positioning of watermarks; SaveToFile method being inadvertently identified as deprecated by Code Insight; and using special characters when creating PDF name objects. Gnostice is pleased to release Version 3.0.1 of XtremePDFConverter VCL. This release provides support for the latest XE version of Delphi from Embarcadero. We are pleased to release Version 3.4.7 of PDFtoolkit VCL. This version supports the new RAD Studio XE development platform from Embarcadero. A highlight of this update is better support for Chinese fonts. This update contains several other enhancements and fixes. Gnostice is pleased to announce the release of Build 194 of eDocEngine v3.0.1. This special build brings you support for RAD Studio XE, the latest Delphi/C++Builder development platform from Embarcadero. We are pleased to release Version 3.0.5 of PDFOne .NET, our all-in-one PDF component suite for .NET developers. This update provides support for programmatic scrolling in the PDF viewer component and a new method to overlay PDF page content. Several other enhancements and fixes are included. We are pleased to release Version 3.0.1 from eDocEngine VCL. This version is ready for the the upcoming XE version of RAD Studio from Embarcadero. This update contains several other enhancements and fixes. Gnostice is pleased to announce the release of Version 3.0.4 of PDFOne .NET. In this update, the PDF document class gains the ability to insert a page break and also rotate the contents of a page. Several other enhancements and fixes are also included. Gnostice is pleased to release Version 3 of eDocEngine, our document-creation VCL component suite for Delphi and C++Builder developers. In this release, processing of non-Latin text by the PDF engine was fully re-written to support Unicode. Version 3 supports Delphi 5/6/7/2005/2006/2007/2009/2010 and C++Builder 6/2006/2007/2009/2010. It also supports newer versions of Windows and Office. Also included is a wizard for automated compilation and installation of report-export interface components. Gnostice is pleased to announce the release of Version 3.5.2 of PDFOne (for Java), our PDF component suite for Java developers. In this release, PDFOne supports the creation of Java applications that are bundled as JNLP clients and delivered over the Net. Please check our online JNLP demos. Users will also be happy to note that PdfDocument class now can directly create, load, save PDF document without the use of a PdfWriter or PdfReader class. A number of other enhancements and fixes are also included. We are pleased to release Version 3.0.3 of PDFOne .NET, our all-in-one PDF component suite. In this release, we have added more control over the viewer and printer components and also included several other enhancements and fixes. Gnostice is pleased to announce the release of Version 3.5.1 for PDFOne (for Java). In this release, we have included support for reading document encrypted with AES 128-bit algorithm. A number of other enhancements and fixes are also included. Delphi gurus Marco Cantù and Cary Jensen will be back on tour with Delphi Developer Days 2010. Cantù and Jensen will cover United States (Washington DC, Los Angeles and Chicago), United Kingdom (London), and Germany (Frankfurt). Gnostice is proud to be associated with the tour as a sponsor. More information is available at DelphiDeveloperDays.com. Gnostice is pleased to announce that XtremePDFConverter VCL is finally available for download. XtremePDFConverter VCL is a powerful VCL component for intelligently converting PDF to easily editable Word RTF documents. Gnostice is pleased to release Version 3.0.1.2 of PDFOne .NET, our all-in-one PDF component suite. In this minor release, we have added support for rendering tiling patterns and form fields without appearance streams. There are also a number of fixes for issues reported by customers. We are pleased to announce the availability of eDocEngine v3.0 Beta #3. Beta #3 includes further optimized support for Unicode text rendering and now with full support for complex scripts, right-to-left writing mode with optimized font mapping for mixed language text strings. This beta also fixes other issues, is optimized for speed and PDF output file size, includes a full Setup program for automatic installation under Delphi RAD Studio 2010, 2009, 2007; Delphi BDS 2006; Delphi 2005; Delphi 7, 6, and includes Export Interfaces (needs manual installation for now) for all reporting and third-party tools that were supported with v2.5.2. Gnostice is pleased to announce the release of Version 3.4.6 of PDFtoolkit VCL. Highlights of this release include Unicode support and font rendering optimizations for TgtPDFDocument.TextOut method and TgtTextWatermarkTemplate class. Gnostice is pleased to release the final beta of XtremePDFConverter VCL. In this beta, we support image export from PDF. We have also made several other enhancements and fixes. We have prepared an installer for Delphi 2010 users. Other users can try an EXE demo. In this preview, we have made several enhancements and fixes including detection of numbered lists using roman letter bullets (a., b., c.... and A. B. C....). Gnostice is pleased to announce the release of Version v3.0.1 of PDFOne .NET. A highlight of this maintenance update is simplified deployment steps and enhanced fault tolerance. Gnostice is pleased to announce the release of v3.4.4. In this maintenance update, we have fixed several issues reported by customers. A major change in this version is related to the TgPDFDocument.GetPageElements method. The TgtPDFTextElement instances returned by this method now provide the x-y coordinates as specified in the PDF document. Gnostice Information Technologies is pleased to announce the availability of PDFOn .NET Version 3. In this major release, all PDFOne components become 64-bit compatible. This release also includes a new .NET rendering engine, speed and memory optimizations, support for advanced mouse operations on PDF viewer, and special optimization for viewing with remote desktop connections and virtual machines. Gnostice Information Technologies is pleased to announce the release of Version 3.4.2. This is a free update to our PDFtoolkit v3.x and XtremeDevSystem VCL Subscription customers. In this update, we have overhauled bookmarks creation and processing, and also made several enhancements and fixes. Gnostice Information Technologies is pleased to announce the release of Version 2.1.3 of PDFOne .NET. A highlight of this release is faster rendering by PDF viewer and printer components. This update includes several other enhancements and fixes. Gnostice Information Technologies is pleased to announce the release of Version 3.4 of PDFtoolkit VCL. In this update, we have focused on rendering optimizations, enhanced functionality for digital signing and several fixes. The rendering enhancements are mostly under-the-hood but are very appreciable when viewing and printing PDF documents. We introduced our XtremeDevSystem VCL Universal Subscription in our second session at CodeRage 4. Full details are now available. We also have links to the video replays of the two sessions. Gnostice Information Technologies is pleased to announce the release of PDFtoolkit Version 3.3. Highlights of this release include the ability to add digital signatures to PDFs, viewing and printing optimizations, and support for Delphi 2010. Gnostice Information Technologies is pleased to announce the release of eDocEngine v2.5.2. In this release, we have overhauled the product with regard to Delphi 2009 support and added support for Delphi 2010. There have been several optimizations with regard to rendering Metafiles and RTF content to PDF. Gnostice Information Technologies is pleased to announce the release of Version 2.1.2 of PDFOne .NET. This update includes several enhancements and fixes. Gnostice is pleased to announce the release of Version 3.5 of PDFOne (for Java platform). This update brings optimized page rendering and scrolling abilities of the viewer component, and several other enhancements. Gnostice is pleased to announce the release of Version 1.4 of Free PDF Reader. A highlight of this update is support for images with JPEG-2000 encoding, and improved multipage rendering and scrolling. Gnostice Information Technologies is pleased to announce the release of Version 3.2.1 of PDFtoolkit VCL. This update restores support for Delphi 5 and some C++Builder versions that was not previously available. Version 3.2.1 resolves some critical issues reported with certain kinds of PDF documents. Gnostice is pleased to announce the release of Version 2.0 of ONEView, our multi-format file viewer-printer-converter application. Version 2.0 brings you support for latest formats of PDF and popular Delphi reporting tools. Gnostice Information Technologies is pleased to announce the release of Version 3.4 of PDFOne (for Java platform). This update brings you some exciting viewer features such as multi-page viewing, navigation history, integrated navigation panel, and page display options. Gnostice Information Technologies is please announce the availability of Version 1.3 of Free PDF Reader, the free alternative PDF viewer for Windows, Linux, and Mac. This updated brings you multi-page viewing and ability to export to multi-page TIFFs images. Gnostice Information technologies is pleased to announce the release of Version 3.2 of PDFtoolkit VCL. A highlight of this update is mouse wheel support and pan-and-zoom features in the viewer component. Gnostice Information Technologies is pleased to announce the release of Version 2.1.1 of PDFOne .NET. This update includes enhanced PDF viewing and printing ability and some new methods and properties in the PDF document component. Gnostice is pleased to announce the release of Free PDF Reader Version 1.2. A highlight of this update is support for Apple Mac (OS X) computers and new printing options. Gnostice is pleased to announce the release of Version 2.1 of PDFOne .NET. This update includes a new interactive PDF bookmarks component and Delphi Prism support. Gnostice Information Technologies is pleased to release Version v3.3 of PDFOne Java. The highlight of this update is numerous printer and viewer enhancements and full support for Apple Macs (OS X). Gnostice Information Technologies is pleased to announce the release of Version 3.1 of PDFtoolkit VCL. This release includes several improvements and bug fixes. The much-awaited change from v3.0.x is the availability of full source code (with ProPlus edition) and absence of external DLLs. You can now ship single-EXE applications. NOTE: This version does not support Delphi 5 and any version of C++Builder. Our next update will have full support for these IDEs. Gnostice Information Technologies is pleased to announce the release of Version 3.2 of PDFOne Java. This minor release includes enhancements to the viewer and printer components, and a number of fixes. Gnostice is pleased to announce the release of Free PDF Reader v1.1. This update includes improvements such as interactive links and print-to-file option. A number of other enhancements and fixes are also included. Gnostice Information Technologies is pleased to announce the release of Version 3.0.2 of PDFtoolkit VCL. This minor release contains several enhancements and fixes. Gnostice Information Technologies is pleased to announce the final release of Version 2.0 of PDFOne .NET. In this major release, we have introduced a new ProPlus edition. This edition will contain the new PDF viewer and printer components. Gnostice Information Technologies is pleased to announce the release of Version 3.0.1 of PDFtoolkit VCL. This minor release includes support for JPX-encoded images and some fixes. The help file has been updated with some new FAQ topics. Gnostice Information Technologies is pleased to announce the release of Version 3.0 of PDFtoolkit VCL. This major version brings you a host of new PDF viewing, printing and processing functionality with big improvements in speed and scalability. PDFtoolkit now supports most of popular font types, image formats and types, colorspaces, and compression techniques. Gnostice is pleased to announce the availability of Free PDF Reader 1.0. Gnostice Free PDF Reader is a portable and fast PDF viewer application. Free PDF Reader is powered by Gnostice PDFOne Java Professional edition, a PDF-component suite for Java developers. Free PDF Reader will be updated along with future releases of PDFOne Java. Gnostice Information Technologies is pleased to release Version v3.1 of PDFOne Java. This minor update includes several improvements in the viewer component and some fixes. Videos and demo source code from the Gnostice session from CodeRage III Virtual Conference are now available. Gnostice Information Technologies is pleased to release Gnostice Print2eDoc v1.20. This minor release features a Microsoft® Outlook™ Add-in, special Windows Explorer context menu, Brazilian Portuguese UI localization, and template support in Preview/Designer. Gnostice Information Technologies is pleased to release Gnostice Print2eDoc SDK v1.20. This minor release includes a new SDK property for UI localization and deployment kit command-line options for specifying UI localization and installing special Windows Explorer context menu. Gnostice Information Technologies is pleased to release Gnostice PDFOne Java v3.0. This major version includes an optimized PDF document component, updated viweer and printer components supporting several new font types, and a brand-new bookmark panel component. Gnostice Information Technologies is pleased to announce the availability of eDocEngine VCL Version 2.51. Among other things, this minor release includes CodeGear RAD Studio 2009 and support for ReportBuilder v11.00. Gnostice Information Technologies is pleased to release Gnostice Print2eDoc v1.10. This minor release features more user-friendly interface changes, a silent printing option, and support for converting Microsoft Word document inline shapes to PDF form fields. Gnostice Information Technologies is pleased to release Gnostice Print2eDoc SDK v1.10. This minor release includes support for converting Microsoft Word document inline shapes to PDF form fields. Gnostice Information Technologies is pleased to release Gnostice PDFOne Java v2.1. This minor version includes enhancements such as PDF Forms rendering on viewer, ability to save page contents as images, ability to load documents from a byte array, and ability to set default font for PdfDocument and PdfPage objects . Gnostice Information Technologies is pleased to release PDFOne Java v2.10. This minor update introduces forms rendering in viewer and several other enhancesments and fixes. Gnostice Information Technologies is pleased to release PDFOne Java v2.00. This major update introduces components PDF viewing and printing. Gnostice Information Technologies is pleased to release PDFOne .NET v1.43. This minor release includes enhancements such as support for embedding a font in an existing PDF and a number of fixes. Gnostice Information Technologies is pleased to release Gnostice Print2eDoc v1.05. This minor release includes enhancements such as Add-in support for converting Microsoft Word form fields to PDF form fields, option for selecting a default output format in Printing Preferences dialog, and programming support for ascertaining printer status using Windows messages. Gnostice Information Technologies is pleased to release Gnostice Print2eDoc SDK v1.05. This minor release includes enhancements such as ability to print Microsoft Excel worksheets identified by name and number and a command-line option in Deployment Kit for registering Print2eDoc application. A number of fixes are also included. Gnostice Information Technologies is pleased to release Gnostice Print2eDoc v2.00 Preview. This preview release includes enhancements such as support for CCITT4 images in viewer, improved rendering in viewer, and support for adding annotations to a rotated page. Gnostice Information Technologies is proud to announce that it will be showcasing its PDF tools in the second CodeRage II Virtual Conference organised by CodeGear. Gnostice Information Technologies is pleased to release Gnostice Print2eDoc SDK v1.04. This minor release includes Windows Vista support. Gnostice Information Technologies is pleased to release Gnostice Print2eDoc v1.04. This minor release includes Windows Vista support. Gnostice Information Technologies is pleased to release Gnostice PDFOne .NET v2.00 Beta. Gnostice Information Technologies is pleased to release Gnostice Print2eDoc v1.03. This release includes a number of enhancements including the ability to launch applications when a conversion job starts, when a page is printed, and when a job ends and also several fixes. Gnostice Information Technologies is pleased to release Gnostice Print2eDoc SDK v1.03. This release includes a number of enhancements including the ability to launch other application around print job events. Gnostice Information Technologies is pleased to announce the release of PDFtoolkit VCL v2.50. Please note that C++Builder 5 & 6 support is not present in ProPlus edition. 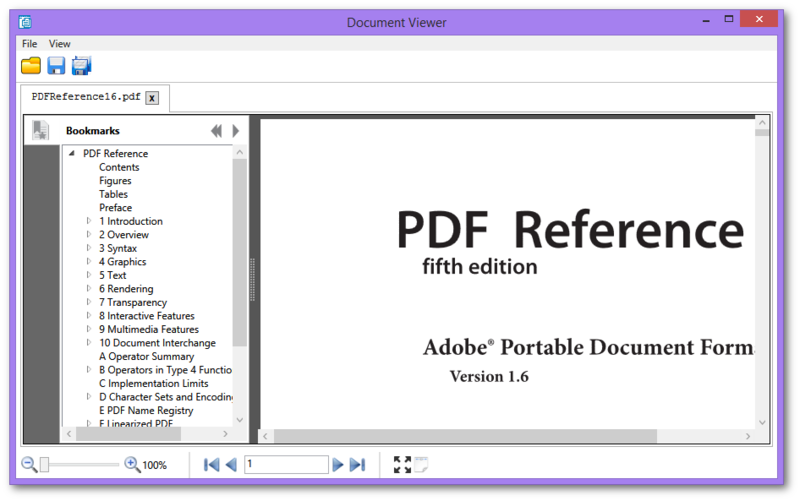 PDFtoolkit now supports almost all popular PDF page operators (used to describe PDF page elements), as defined in PDF Reference 1.6 (Acrobat 7) and works with almost any PDF file created by any application. Version 2.50 is a complete ground-up redesign of the rendering engine, resulting in greatly improved accuracy and quality of viewing and printing. Gnostice Information Technologies is pleased to announce the release of PDFtoolkit ActiveX/.NET v2.50. Gnostice Information Technologies is pleased to announce the release of Gnostice eDocEngine ActiveX/.NET v2.5. Apart from a number of fixes, Version 2.5 includes enhancements to text and Excel output generation. Gnostice Information Technologies is pleased to release Gnostice Print2eDoc SDK v1.02. This release includes a number of enhancements and fixes. Gnostice Information Technologies is pleased to release Gnostice Print2eDoc v1.02. This minor release has provisions for new features introduced in Gnostice Print2eDoc SDK v1.02. Gnostice Information Technologies is pleased to release PDFOne .NET v1.42. This update includes a number of enhancements and fixes. Including support for measuring text width in a particular font, specifying System.Drawing.Bitmap objects for drawing watermarks, creating rotated watermarks, and retrieving fully qualified names of form fields. Gnostice Information Technologies is pleased to announce the release of PDFOne Java v1.42. This update includes a number of enhancements and fixes. Gnostice Information Technologies is proud to announce that it will be showcasing its PDF tools in the first-ever CodeRage Virtual Conference organized by CodeGear. Highlights of the one-week online conference include streaming video presentations by leading tech experts and CodeGear partners, a virtual exhibition hall, and an opportunity to meet other developers. The video presentation sessions are offered free to all attendees. Virtual Conference attendees can register for specific sessions. The Gnostice session "Using Gnostice PDF & e-Reporting Tools Suite" will include a presentation by CEO Girish Patil. It is scheduled for Friday, March 16, 2007 between 6:15 a.m. and 7:30 a.m. PDT (UTC-0700). The presentation will be followed by a live Q&A session. Attendees can submit their queries using CodeGear's ChatJet system. All attendees are eligible for special offers on Gnostice Products - watch the session for further details. Gnostice Information Technologies is pleased to release Print2eDoc SDK v1.01. This minor release includes a fix for the failure to close Microsoft Word files after printing. Gnostice Information Technologies is pleased to release Print2eDoc v1.01. This minor release includes a number of fixes. Gnostice Information Technologies is pleased to release Print2eDoc v1.01. This minor release includes a number of enhancements and fixes. 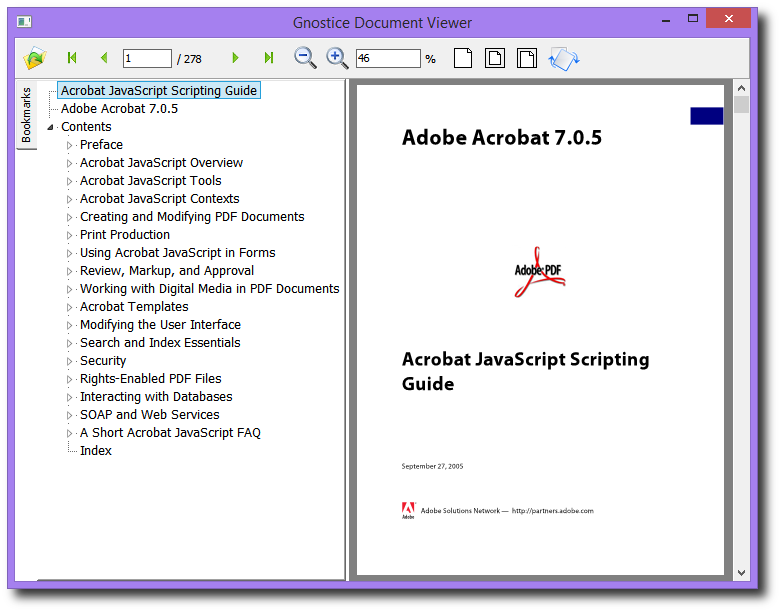 Gnostice Information Technologies is pleased to release Print2eDoc SDK v1.00. This release includes a deployment kit and several enhancements. For older news releases, please click here.